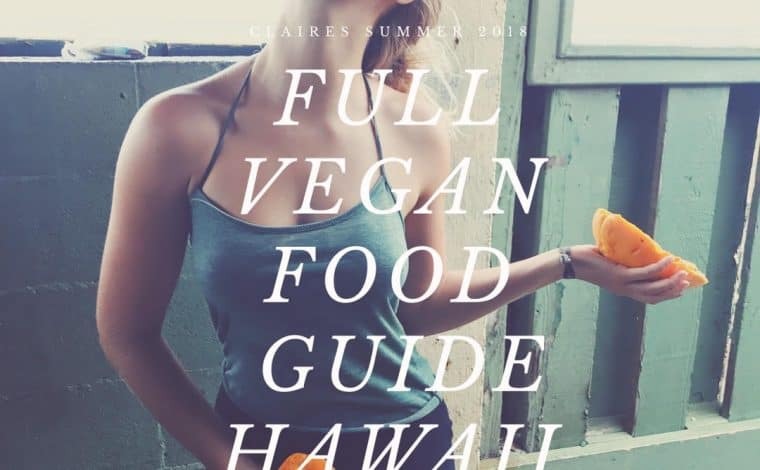 Thank you for your curiosity or just the fact that you want to find some inspiration on how to survive as a Vegan in Hawaii. I spent this summer in Hawaii. 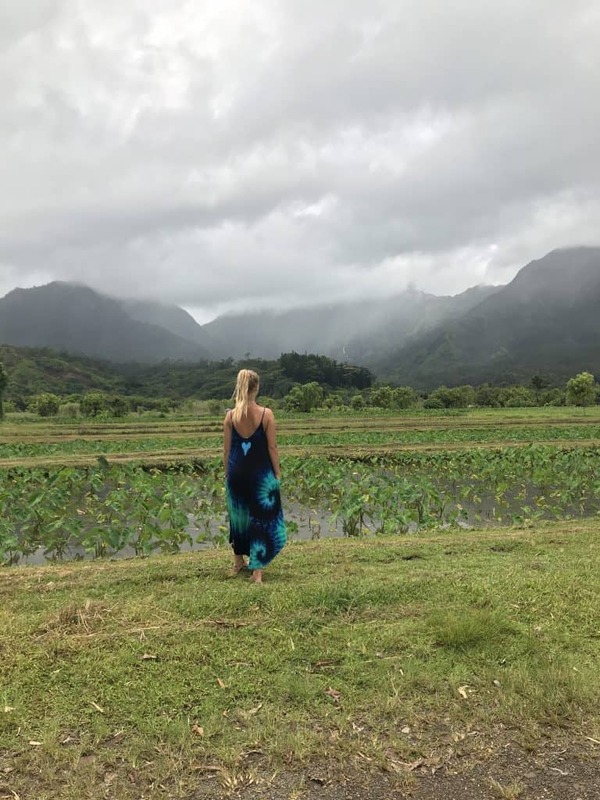 I had so many life-changing experiences, but today I wanted to share with you, my top tips for vegans on the islands of Kaua’i, Oahu, and Big Island. Fresh fruit and veggies SUUUPER EXPENSIVE in stores, so in order to maintain a balanced diet on a budget I relied on a few simple things. 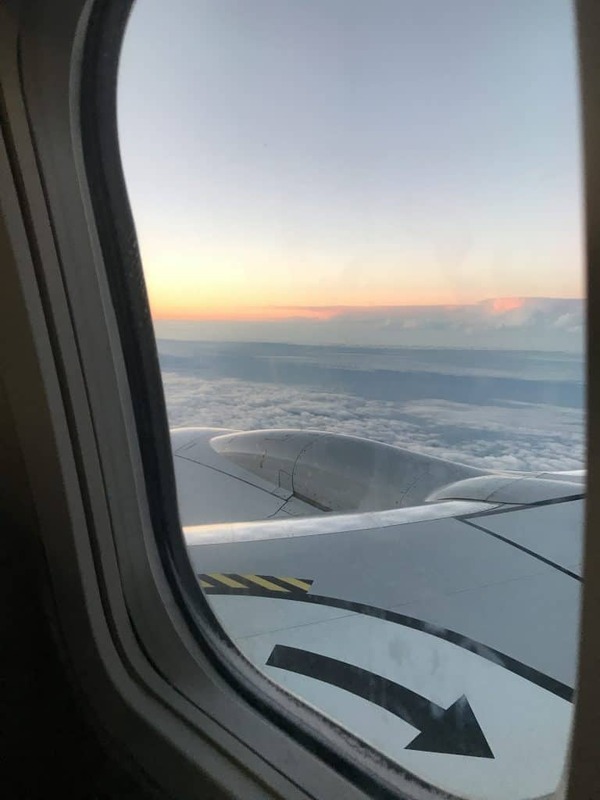 My journey started in Honolulu city and to be honest? I did not stay longer than a week. 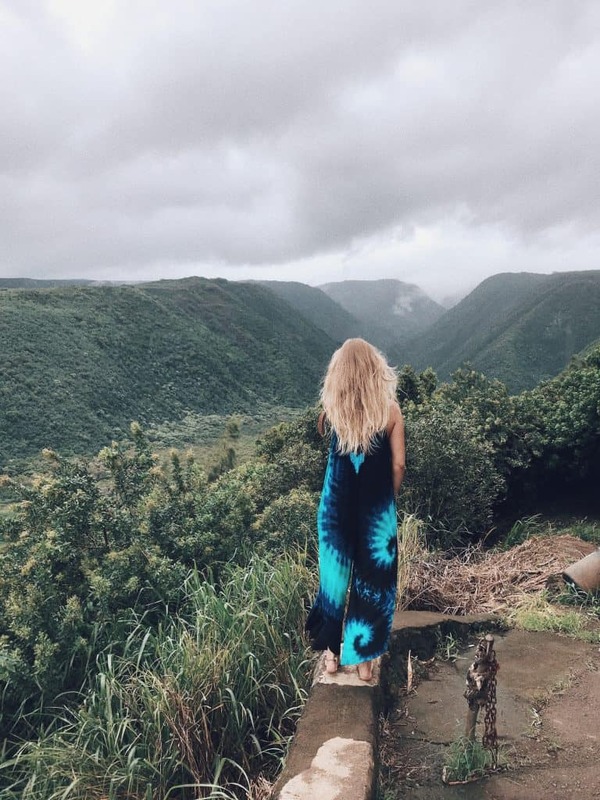 Nature was what was calling me so I wanted to leave Honolulu as soon as I arrived. The North Shore and a really inspiring experience in a Krishna Temple were the experiences that shaped the week I spent on the island. Location: 66-437 Kamehameha Hwy #104, Oahu, located at the north shore of the island. 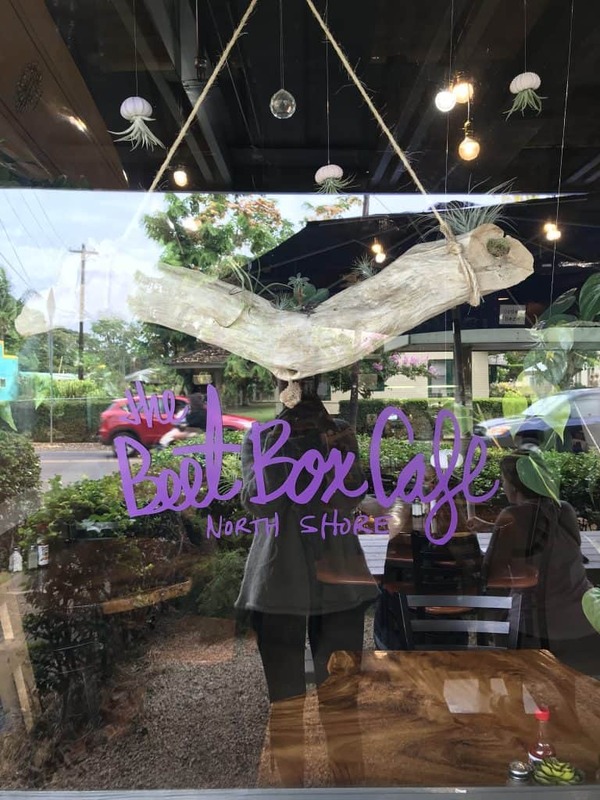 Arriving at the north shore I stumbled into the “beet box” – modern style cafe with all different kinds of healthy, vegan, vegetarian dishes, desserts, smoothies and more. The whole atmosphere was created by the surf boards and all kinds of different woods that were integrated. Service: Super nice and quick. Order at the counter. 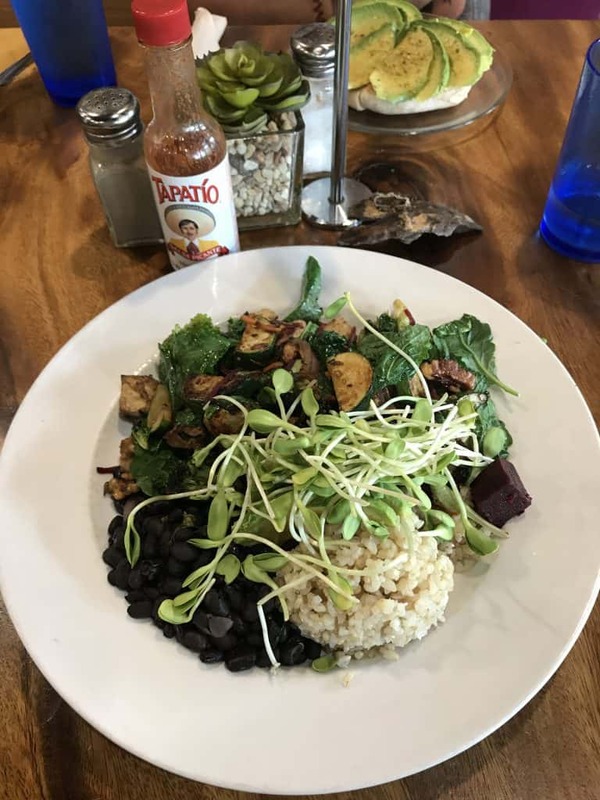 I ordered the “healthy plate of food” as well as a vegan “avocado toast” which both were super satisfying. 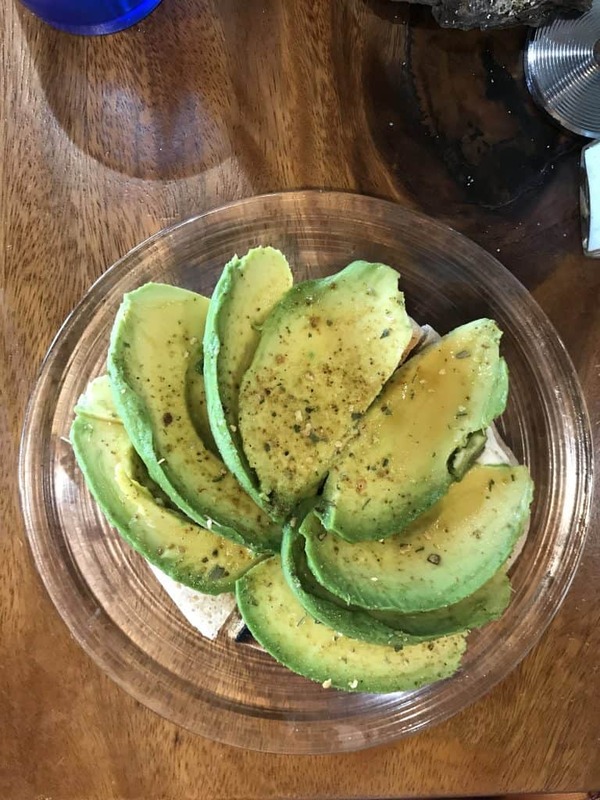 Especially the avocado toast had a special twist with its seasoning. Opinion: Super cute and modern style, still considering the budget definitely a TREAT. The prices were fair but above my budget. Location: 73 S Pauahi St, Honolulu, HI 96813 . When walking through the city, getting super hangry, I stumbled across this sweet little restaurant. Not a totally vegan restaurant but so far the best and cheapest vegan focaccia ever !! The lady behind the counter had the most welcoming smile and I felt home at first sight. A fluffy, garlicky Foccacia with basil and tomatoes with loads of good olive oil. After a long day in the city just the right thing to indulge. 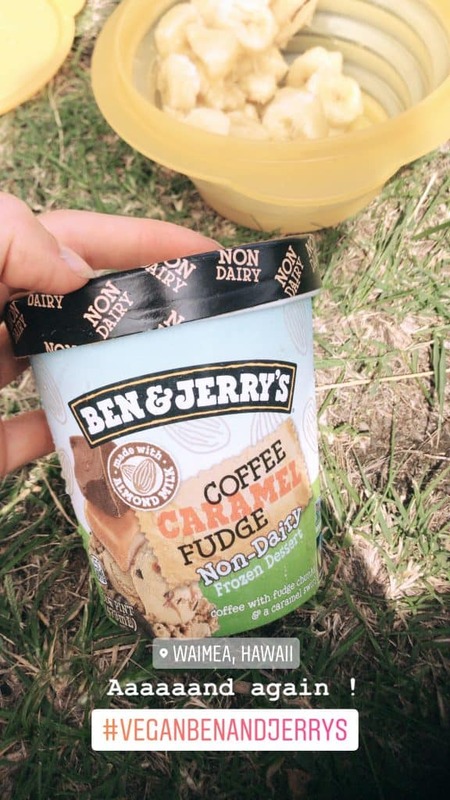 Opinion: that I could not resist having a bite before taking a photo and returning buying four more pieces, tells it all :))) Perfect for a snack! On to the next island. I have spent one month on Kauai and by the time I learned to maintain a balanced diet which suited my budget. To still be able to buy a little bit more “pricy” things like tofu, a salad from the salad bar, kombucha and sourdough bread that I have found I excluded 90% of the time: coffee, regularly buying treats like sweets and eating out too much. 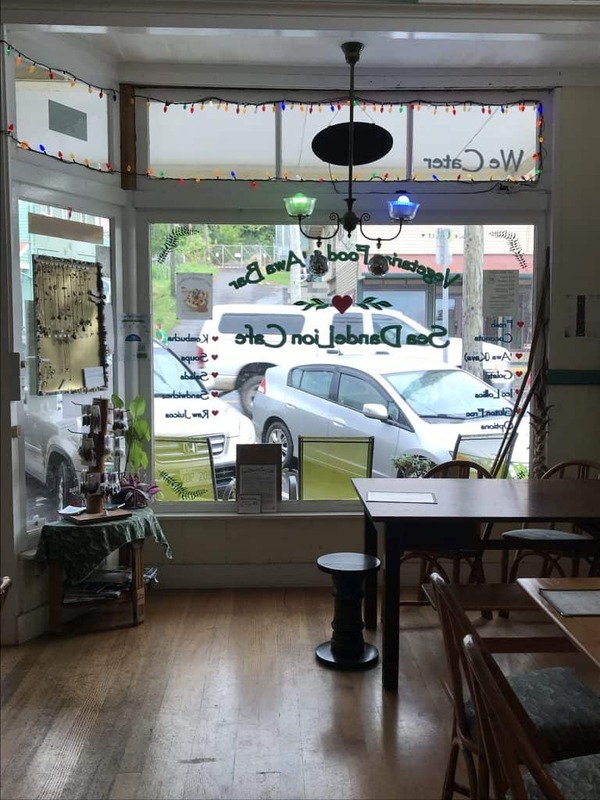 The healthy hut is more than just a natural food store. 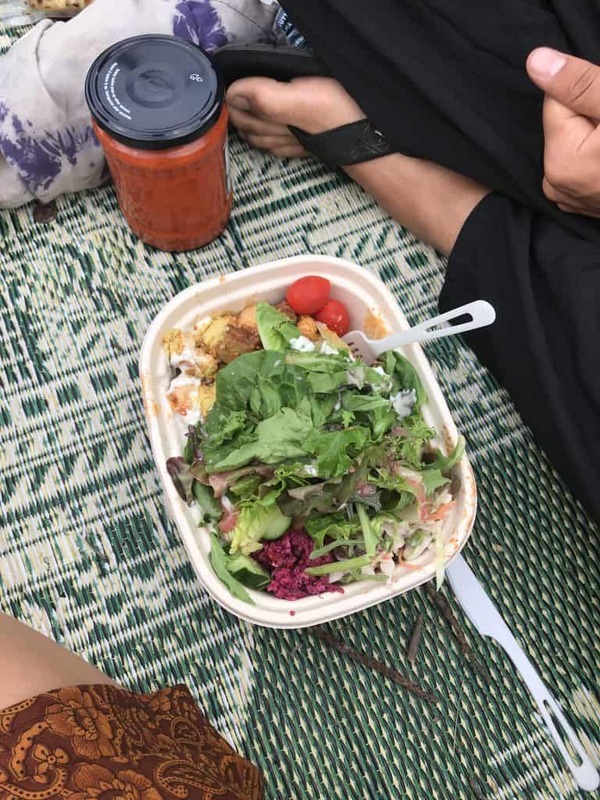 It was a place where I connected with all different kinds of like-minded people, a lawn and banks to sit on, a meditation studio nearby, WIFI, a small restaurant next to it, a super delicious hot and cold bar and just a hot spot in itself. The Food: Unfortunately, that day I was starving to death and ended up forgetting making photos, but I had a super nice salad with all kinds of nuts, seeds, beets, potatoes and a super nice dressing for around 15€ and I was really full afterward. By far the priciest natural food market that I have seen on the islands but the only one I have stumbled upon on Kauai. It is definatly worth a visit just to refill and treat you. Oh Yaaaaas, the midnight Bear Bread. I found them on the Friday “art night” in Hanapepe on the south-east side of the island. Which is the town of Lilo and Stitch by the way? 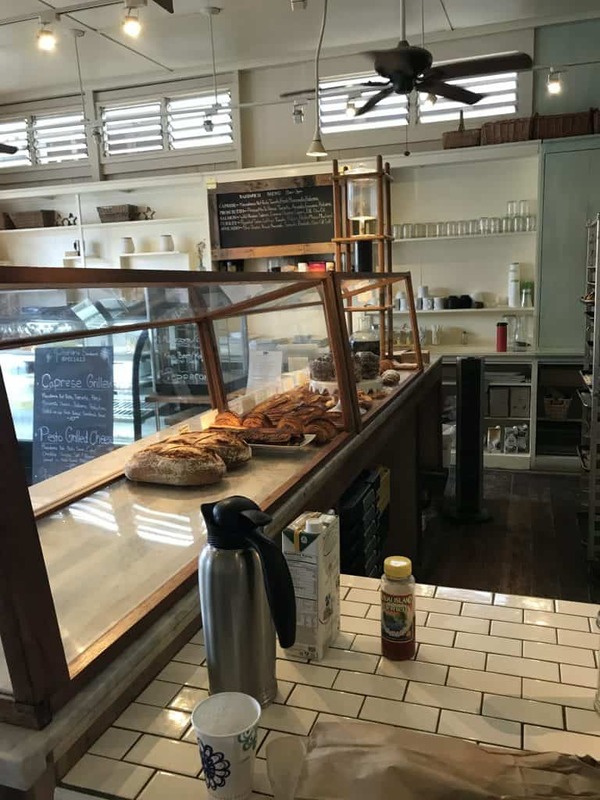 They have incredible Pastry, Pizza, Sandwiches and Sourdough Bread along with incredible coffee and tea, all locally hand-crafted. haha, yes you see correctly: banana and peanut butter. 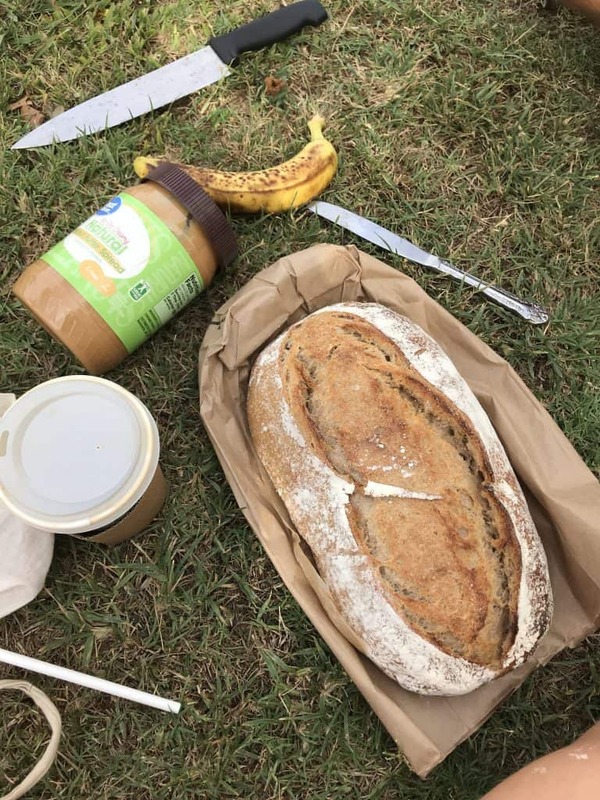 I and my partner ate the whole loaf this day just pure and with PB and Bananas. 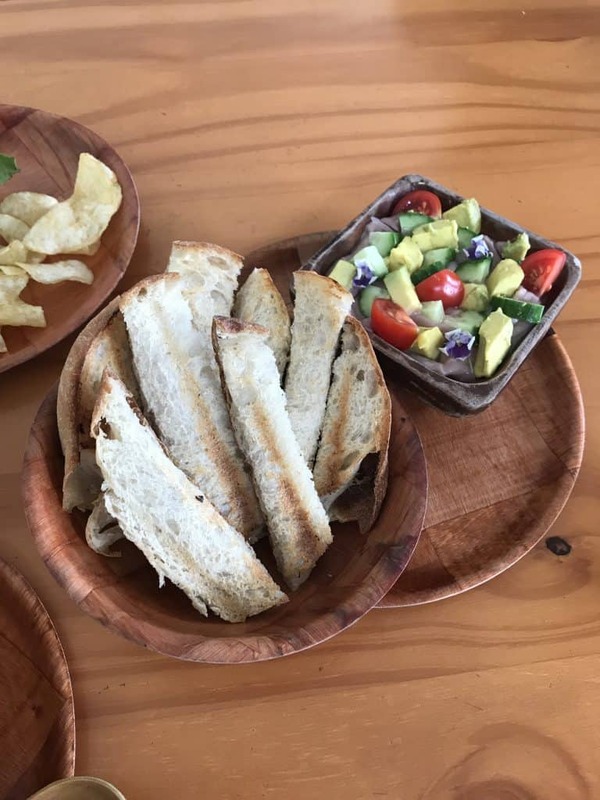 It was simply too good and both of us had been graving sour-dough bread since the first day. I also treated myself with a coffee that day which came in a compostable cup which I adored. The Service: Super humble, nice and funny. 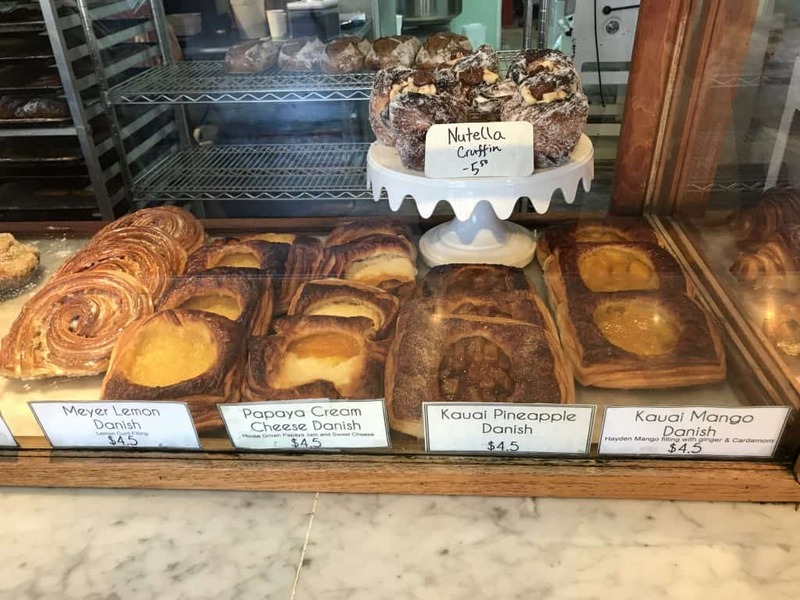 I felt super welcomed and simply the fact that people where gathering outside sitting in circles around the bread and super yummy pastries and enjoying together tells how social and warm this place is. It was so good that I jumped into a bus on 7:30 the other day to buy a bread as a surprise breakfast because I knew it was so good. Location: more on the north side of the island. 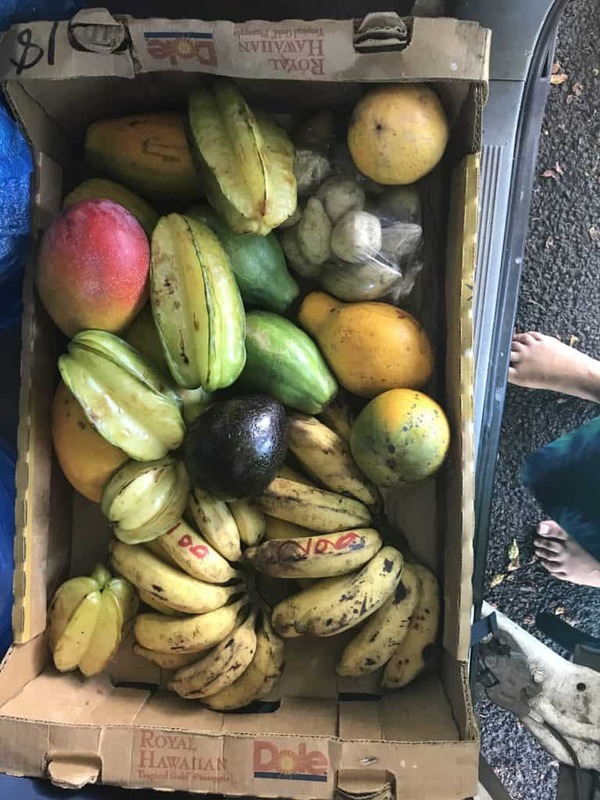 Nature was the best place to find food on this island. I was so gifted! Living in nature, camping or sleeping in a hammock was not always easy but one of the best things that comes with it is that you can rediscover your connection with nature. Waking up by the sun and going to bed with the sun, no media, no artificial distractions what so ever. I have learned so much physically and spiritually in that time. Nature provided me with everything that I needed. What is CRUCIAL when seeking free fruits is that you have to take care of PRIVATE PROPERTY. 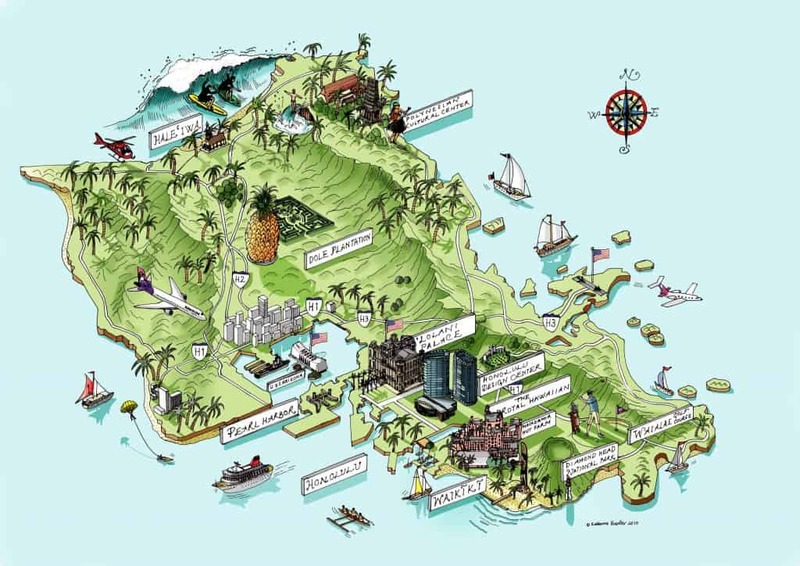 Hawaii is almost 80% of the land that is accessible proclaimed to be private property. It is illegal to take any agricultural goods from places people own, so take care that you don’t. 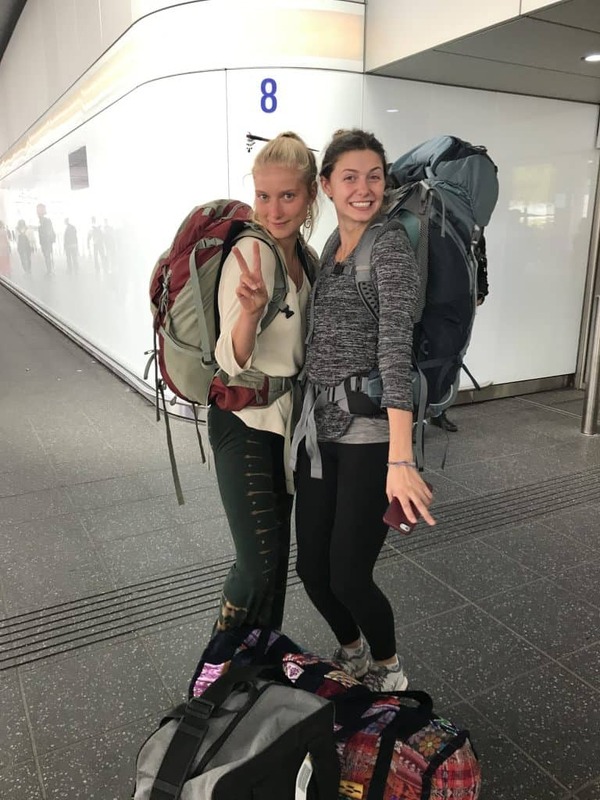 I discovered places just by walking with a backpack on the side of the roads and a little bit further in, just in nature which was not used for anything. 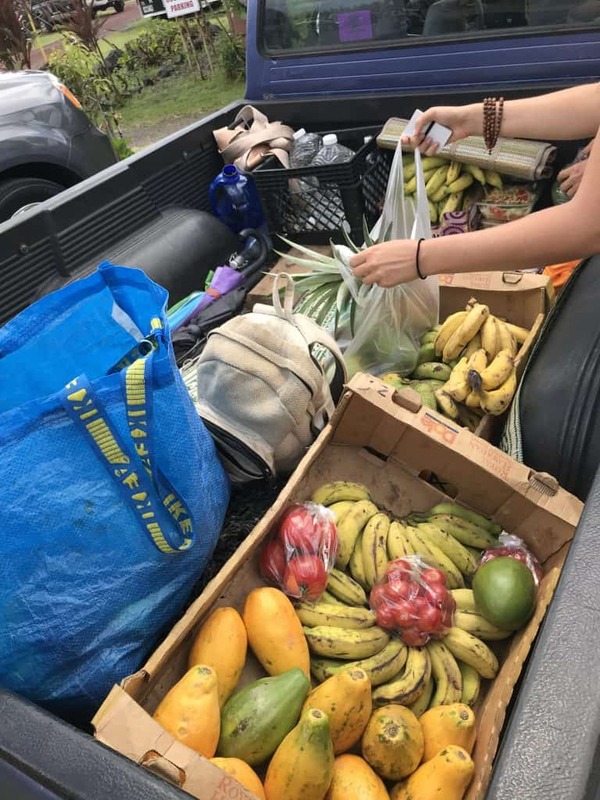 Tips: green papayas and bananas take up to 2 weeks to fully ripen so better stick to the ones that are already starting to get colorful. A machete is a tool which can be super useful when opening coconuts but isn’t a necessity. A rock and a lot of strength when pulling the fibers do the same job. Always give thanks ! say a little prayer, smile and be concsious that the land gifted the food to you. Just smile and me grateful, its such a blessing and you are cared for always. This mentality really grew due to this experience and I found it to be such a blessing and enrichment. 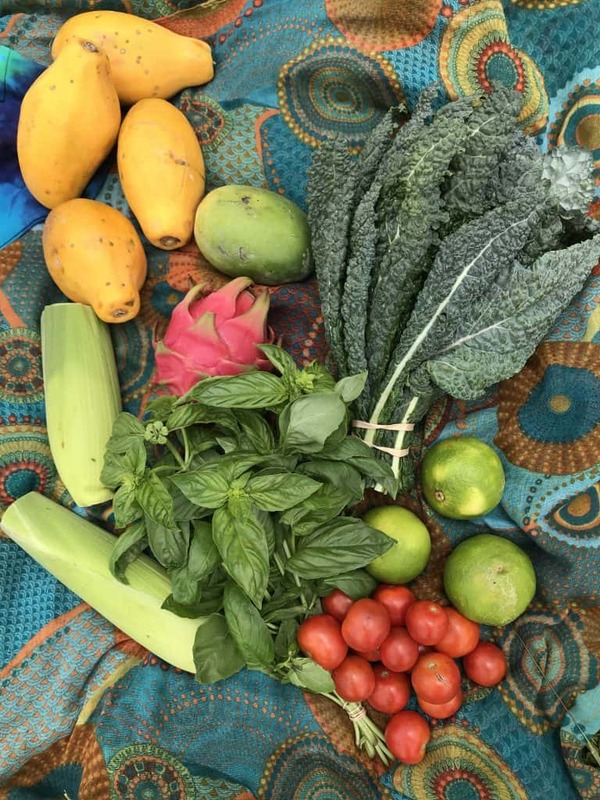 The first and only farmers market that I have gone to on Kauai. Kauai is relatively small and so are the farmer’s markets as far as I have heard. The biggest and most vibrant one is this one. I found so many beautiful divers farmers offering their organic or even biodynamic fruits and veggies. I connected deeply with some of the girls and boys spending their times taking care of the plats and sharing their treasures. 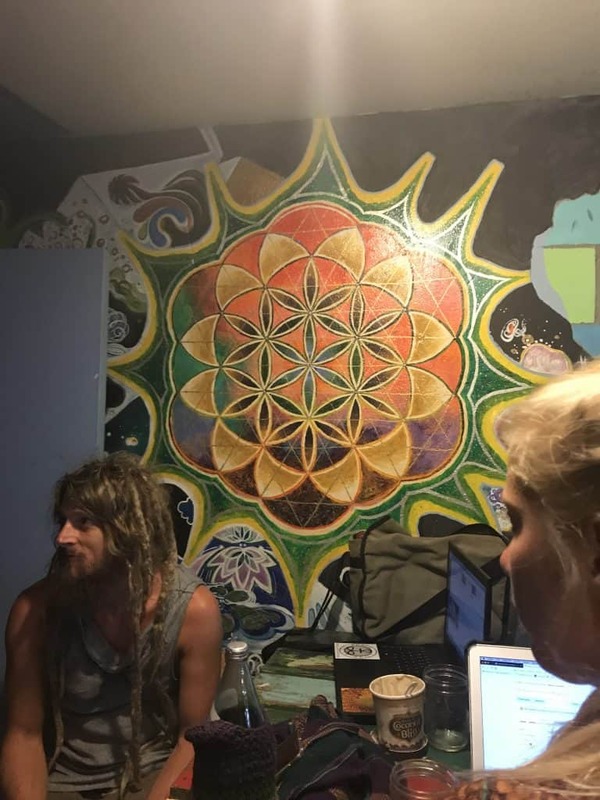 Next to this all different kinds of artists offer their medicinal tinctures, herbs, but also tie diy (the jumper that I love so much is from there), jewelry, drinks, music, bee wax papers, aaaah all different kinds of stuff – so just dive in and float with this luscious, rich flow of art. – that was the motto that I followed, starting to listen rather than demanding and being loud and full of expectations within my self. This silent, peaceful exciting silence also brought me to so many fruits stands that I stumbled upon by just having walked along the roads. This is a very beautiful one. How they work: Most of the time it will be a cabin which is closed with a cloth to protect from flies and hungry animals (don’t worry they live in abundance, like all of us). They are placed there by all the different farms that want to offer their harvest. Its a concept based on trust. You take out what you want, mostly having an indicated price and you put the money inside the indicated box or whatever it might be. Most of the time, it’s very explicit how the systems are intended to work. I found them always to be super duper cheap and interesting. They almost always included a fruit that I have never heard of. All the love the people have put into the building, maintaining and painting the fruit stands still blows me away. 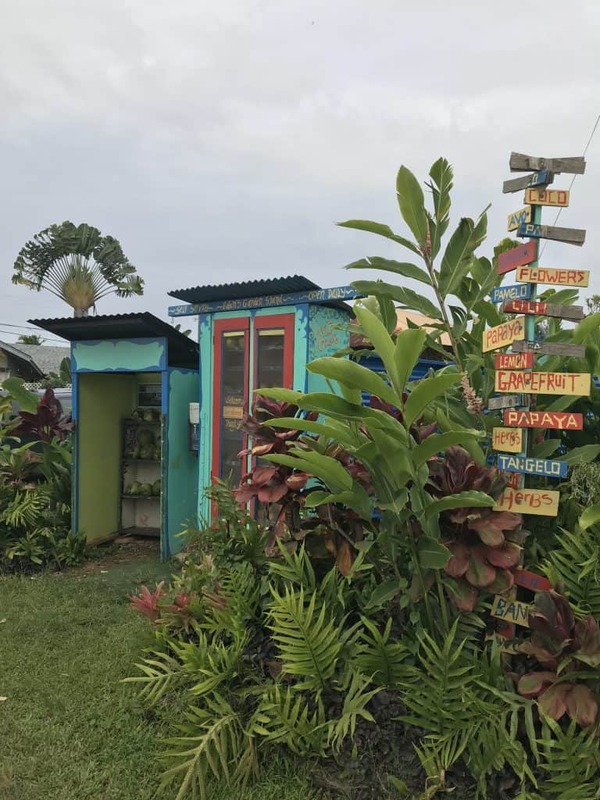 One day in the colorful village of Kapaa. A bigger village/town on the east coast of the island is filled with all different kinds of stores of all kinds. The streets are filled with tourist, still remaining to sustain its charm. We did our laundry there and went for a walk. The city has all different kinds of restaurants and fancy stores crowded by young people that stay n the hostels that are located there. 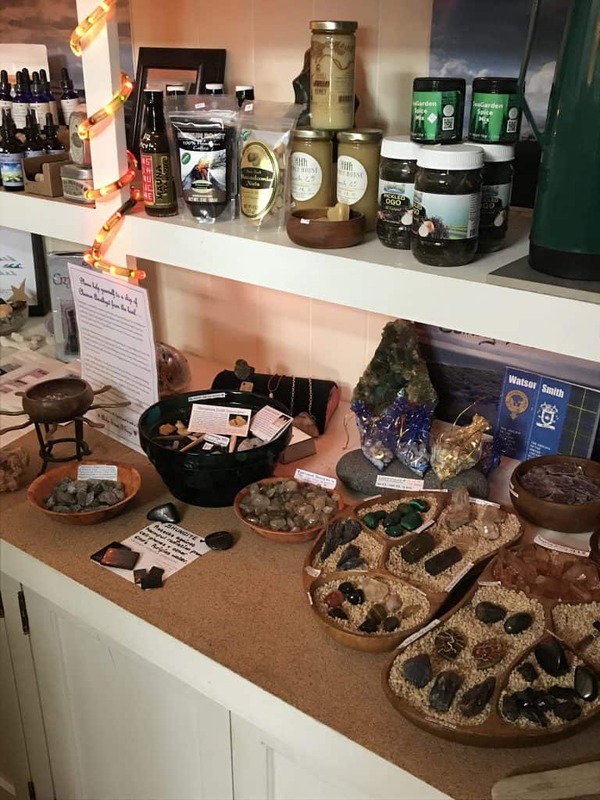 One of my favorite spots the Rhiannon’s Kauai Spirit shop pulled me up the stairs saying “crystals, spirituality, and gifts” thihi, I got lost in there smelling all different kinds of insent sticks and ending up getting two dozens of them. Next to it I found the “spot” an organic frozen yoghut and smoothie bowl place where I found some rest and WIFi. I had (yes its true), the first Acai bowl of my life. I added white pineapple and apple bananas, which are my favorite. It was super creamy and refreshing. 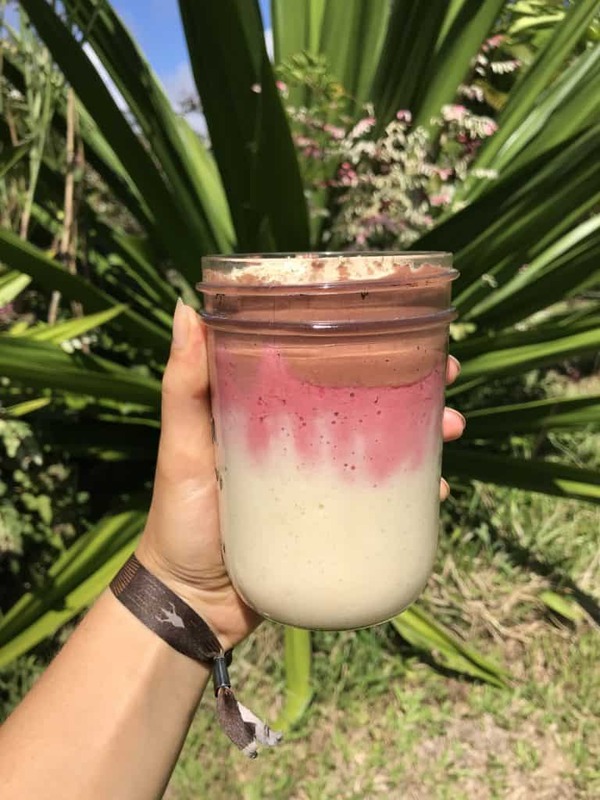 As you might know it from those kinds of healthy pop-up stores you were able to pimp up your smoothie or bowl with all different kinds of toppings and ingredients. 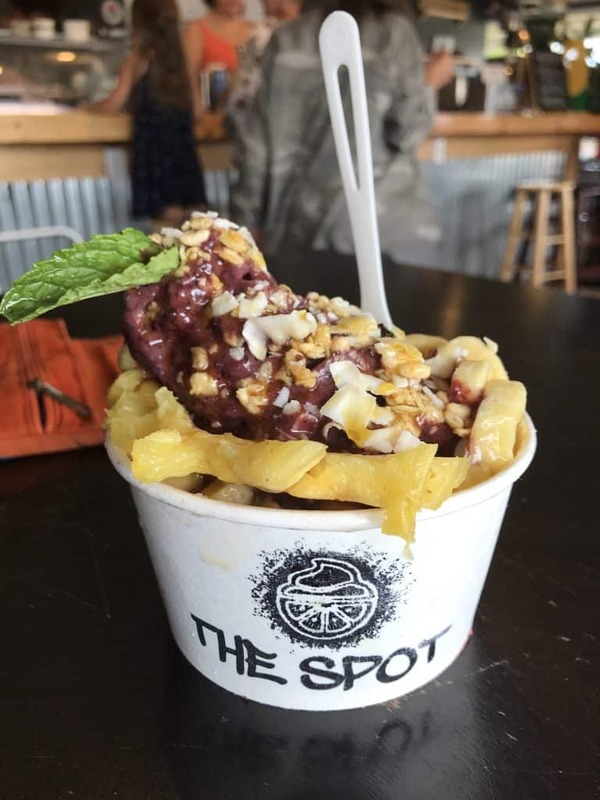 It was delicious and exactly what you expect from an acai bowl. 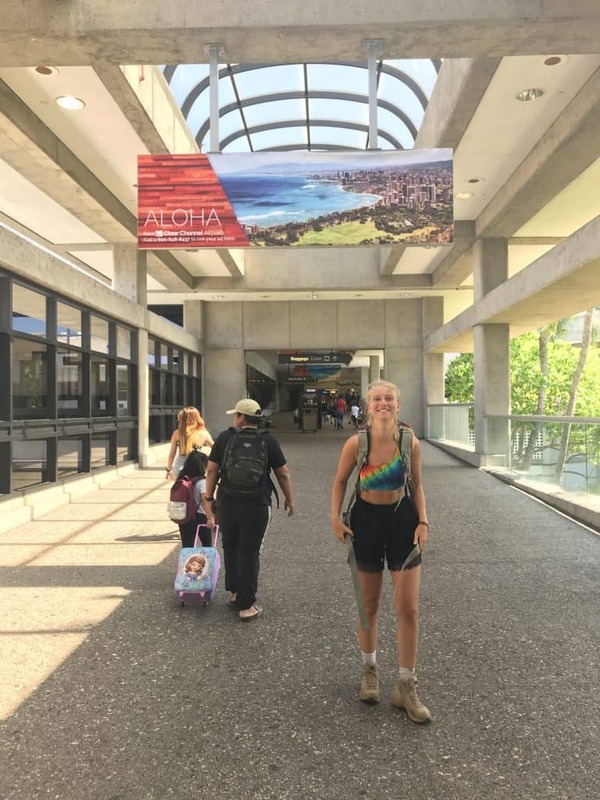 After a month of daydreaming, flying with the wind across Kauai, raining down in thick mystical gray clouds and flowing with the wave of secret beaches we headed to Big Island. Next, to the changes in nature, there is definitely a difference in culture and food consumption. 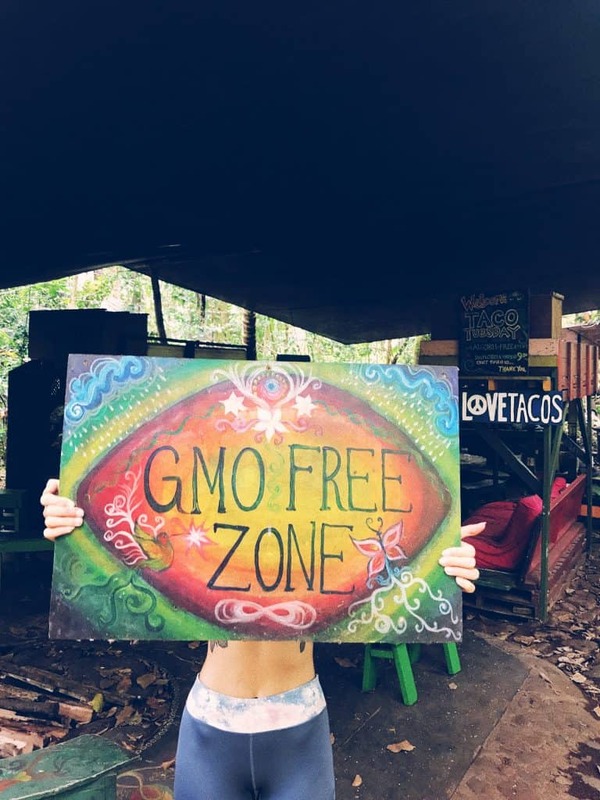 The offer is way more abundant and organic stores are rather a “commonly ” found thing. 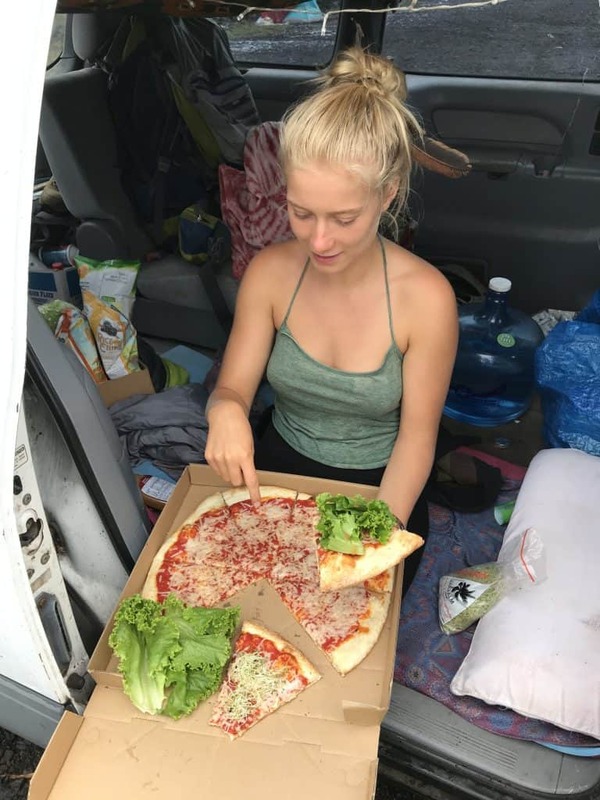 I traveled almost the whole island and had quite some changes in my food consumption. I was eating out and be able to cook, which made a huuuuuge difference. During the tour around the island, we had a little stop at the ocean view. More by accident rather than intention we ended up in the small pizza and bakeshop next to the Malama supermarket as I saw the sign “vegan options”. I think this is my SECRET TIP. 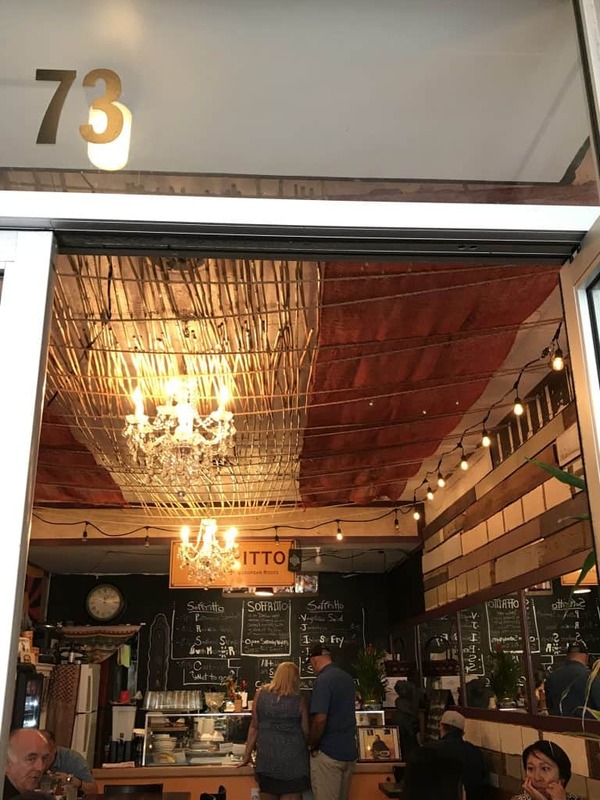 Although the store looks super conventional and the enterieur is a little rustic, the women behind the counter make incredible vegan magharita and by far the best vegan meatball sandwich that I have EVER tried (it was the first, but still incredibly good ;):P). 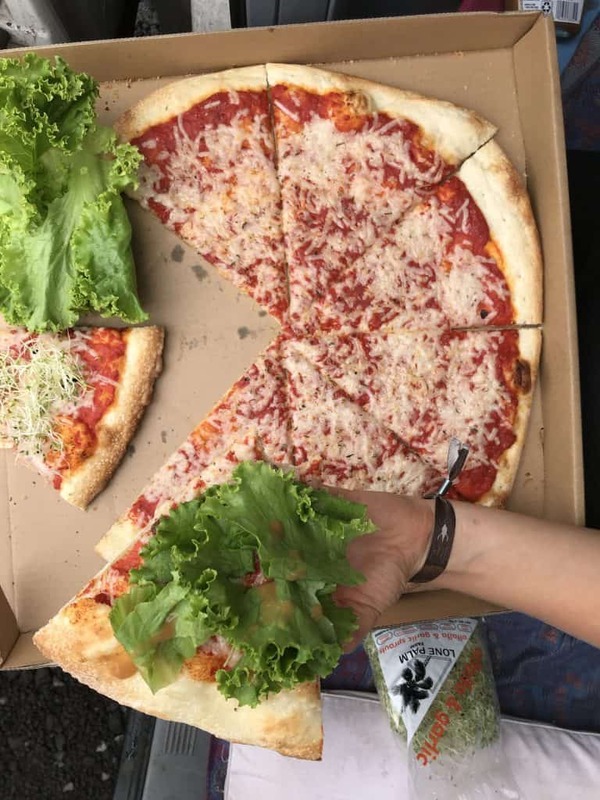 A large Pizza with a thin crust and delicious vegan cheese, (toppings optional) for around 14$ which was in comparison also the cheapest one that I got on the islands. I have a small fetish of always needing salad and sauce, most favorable vinaigrette on my slices. I highly recommend this as it just upgrades the taste a trillion times. Please, just don’t forget to rinse the salad with clean drinking water beforehand. Greet the women (whose name I forgot again) when you visit her. Everyone who entered was shining it felt as if this spot was an established home station for the locals. 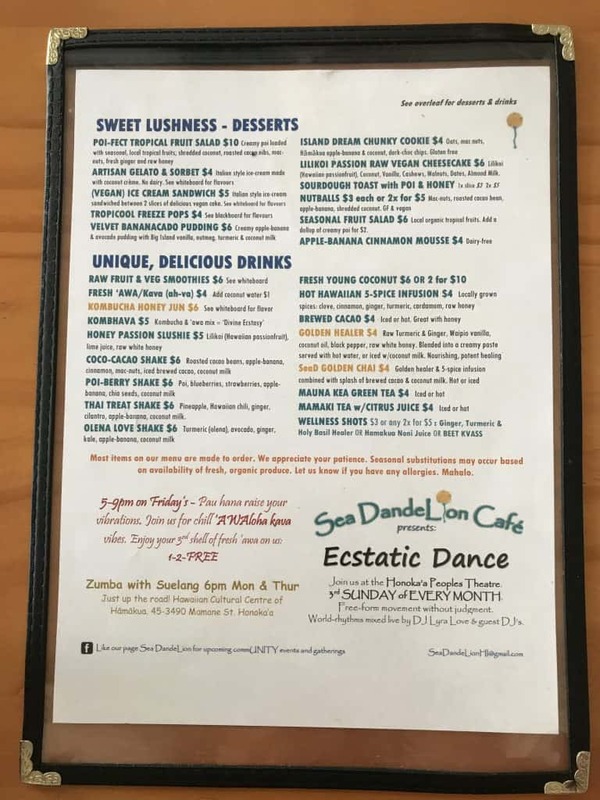 Oh, sea dandelion. This small restaurant, cafe and jewelry shop on the northeast coast of the island was the place that resonated with me the most. 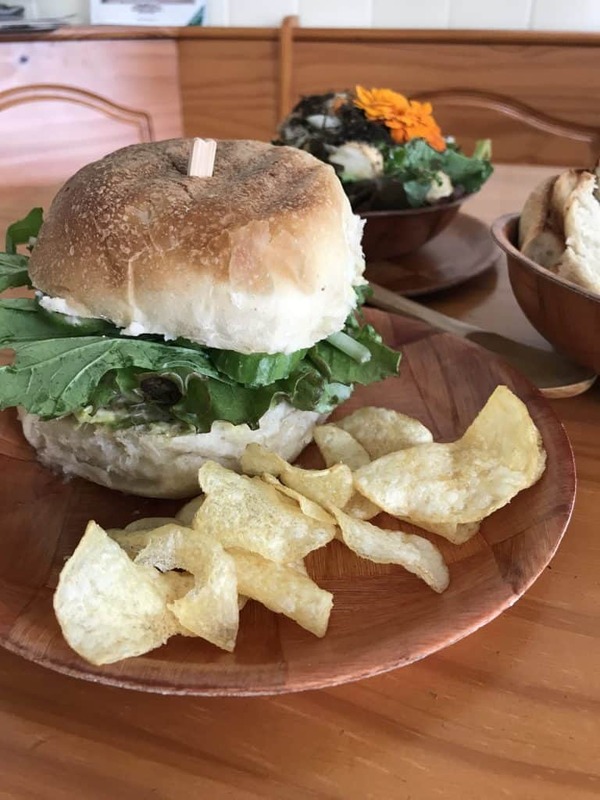 ALL Vegan, organic, local and fusion kitchen between global favourites like pizza and burger and the traditional Hawaiian cuisine. I had poi there for the first time as well as ulu (breadfruit) sourdough bread. 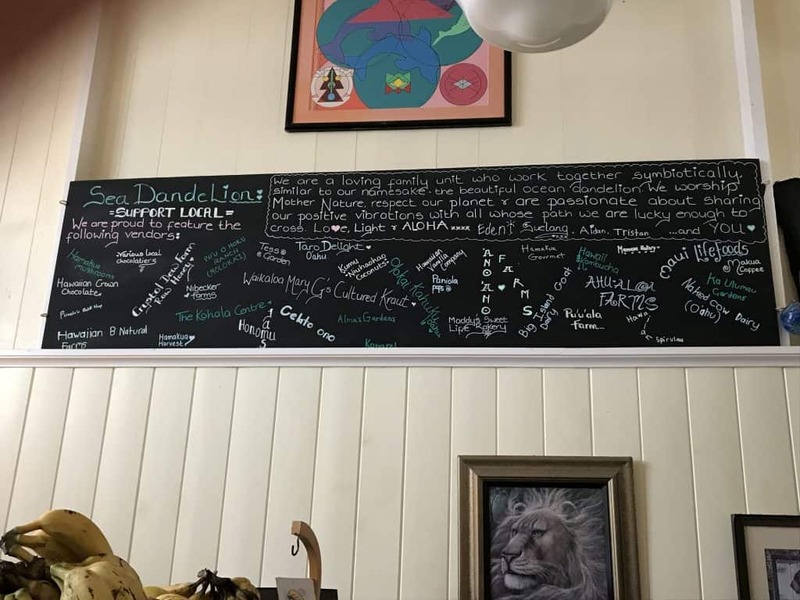 Over the counter, they have a big blackboard which lists all local producers and farmers who they support by creating this restaurant including their products. Next to this Sue and her husband are the simply beautiful soul. They both live their passion for creating food, hubs, and art. I bought 4 crystals there which she takes great care about beforehand. She charges them in all different kinds of sacred places. I recognize a good crystal shop from the fact that the crystals are placed in rice which prevents them from energetically neutralizing oneself. 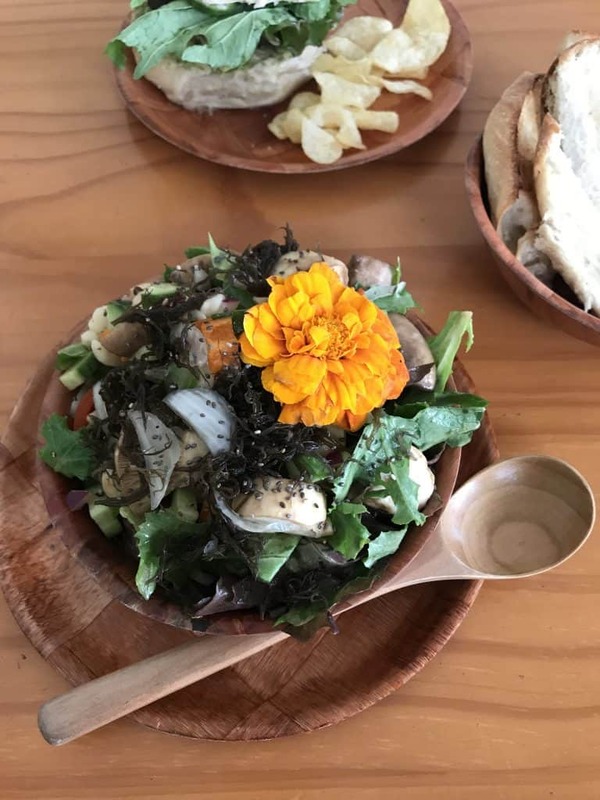 I had a super delicious oyster mushroom salad with pickled seaweed, the ulu-sourdough bun, and taro burger and the poi served with ulu-sourdough bread slices. 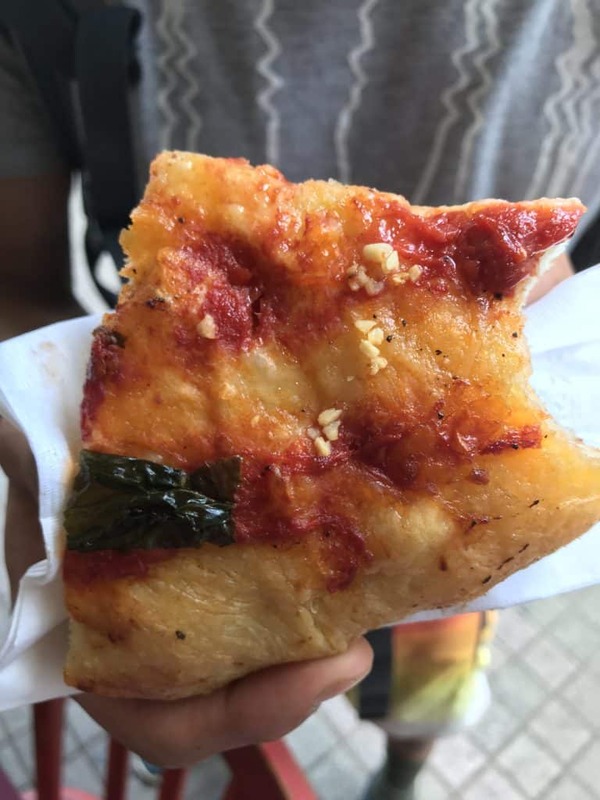 I have to admit that I did not really like the poi but I know that it is more the fact that I don’t like the sour taste which is common for this traditional Hawaiian dish. Fun fact: poi is made from the taro root which is pureed by grinding it after cooking between wood and stone. Poi starts to ferment from the first second on, causing poi explosions when stored in a sealed vessil. They also have crystal card readings which I really enjoyed. 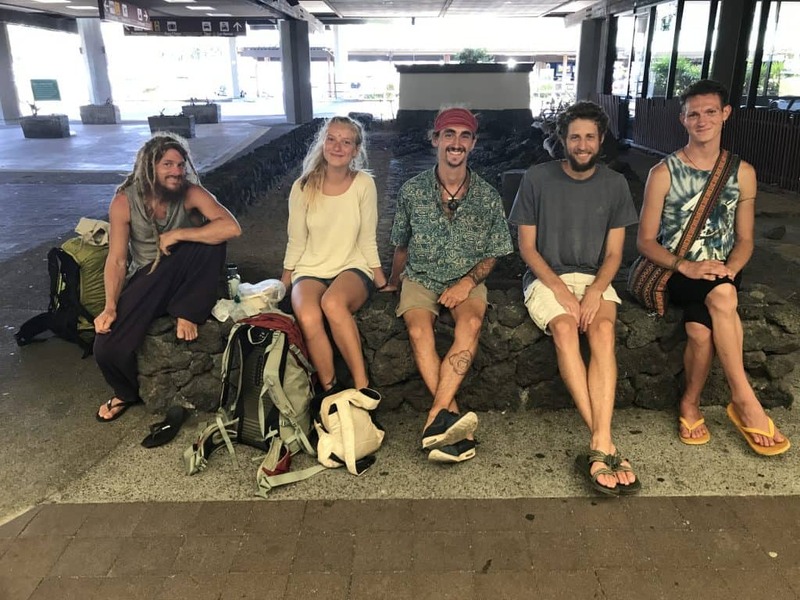 Actually, the whole city of Pahoa is a Street full of places where you meet incredible people, connect, dance, sing and speak freely. The Kava Bar was the place where I would catch wifi and drink a jun (with honey) and Kombuchas as well as Kava drinks. 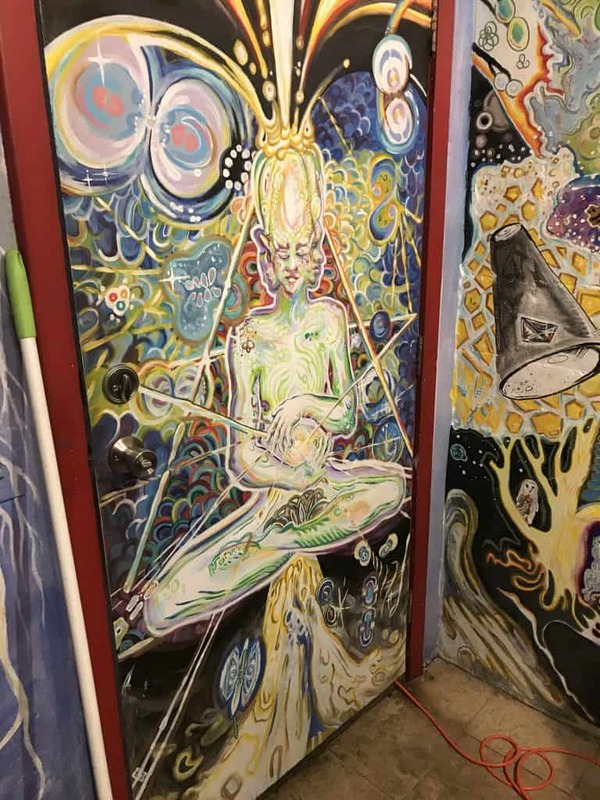 All the walls are filled with spacy art pieces like you can see. They have open-mics where you can participate in creating music or simply enjoy the art of the local people and your friends. 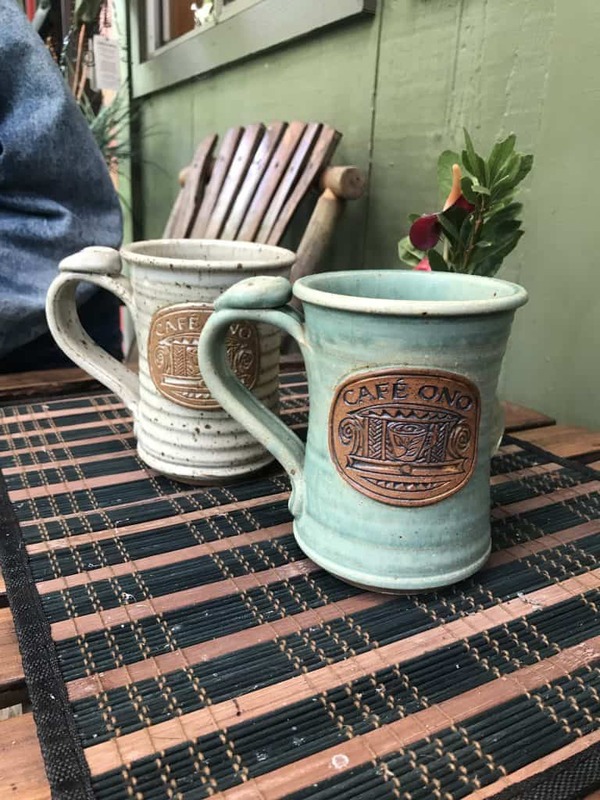 Huge Coffee Mugs, arty walls, all handmade, local hotspot, free wifi, all organic vegan Breakfast, sourdough bagels with vegan cream cheese, sprouts and vanilla almond milk lattes. 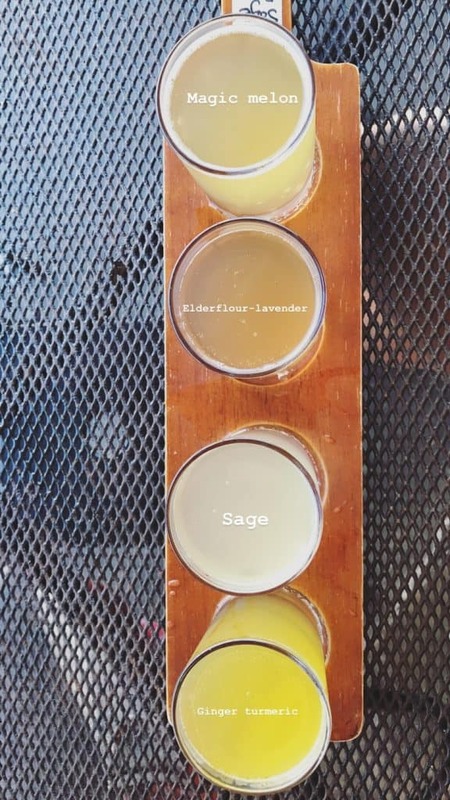 – What were my impressions of the tin shack located in Pahoa town. 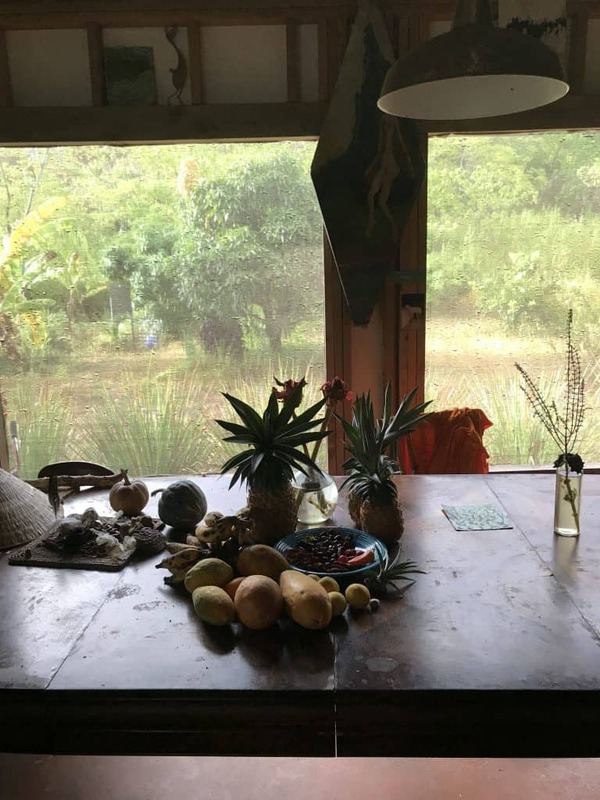 The Natural food store in Pahoa was more than just my favorite station to get my lunch from the hot/salad bar. 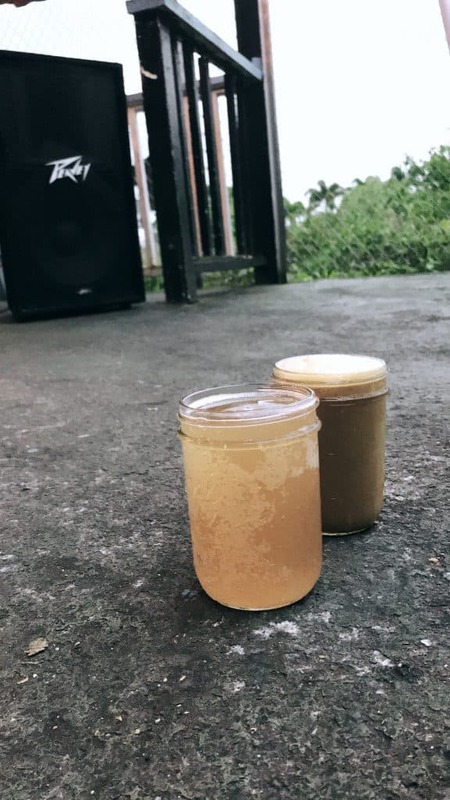 It was a place where I met everyone, connected, danced at the second Saturday of the month and felt at home. 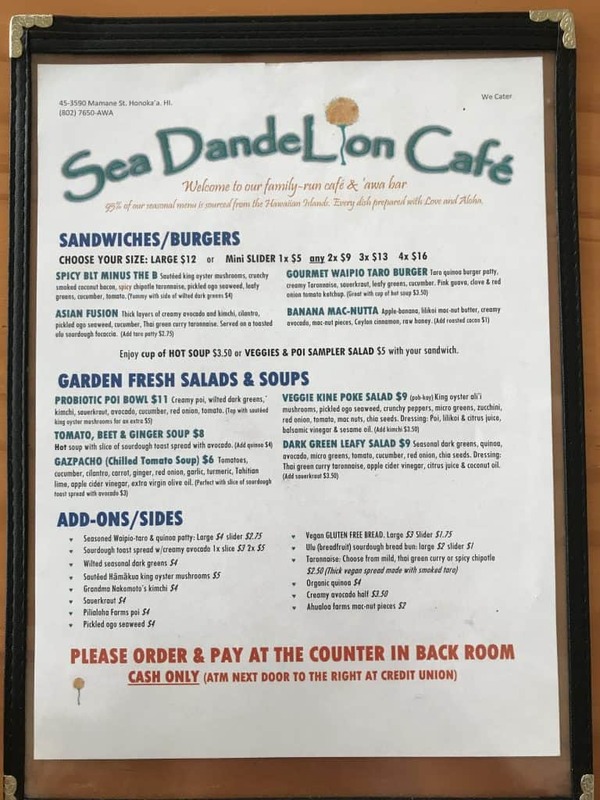 They have incredibly organic, local products as well as a large always changing offer of hot dishes and a salad bar with the BEST vegan ranch dressing I have and probably ever will taste. Looking at the variety of foods, the quality and the amount the hot bar has a reasonable price (8$ per lbs). I was mostly satisfied with 1,5lbs 😉). 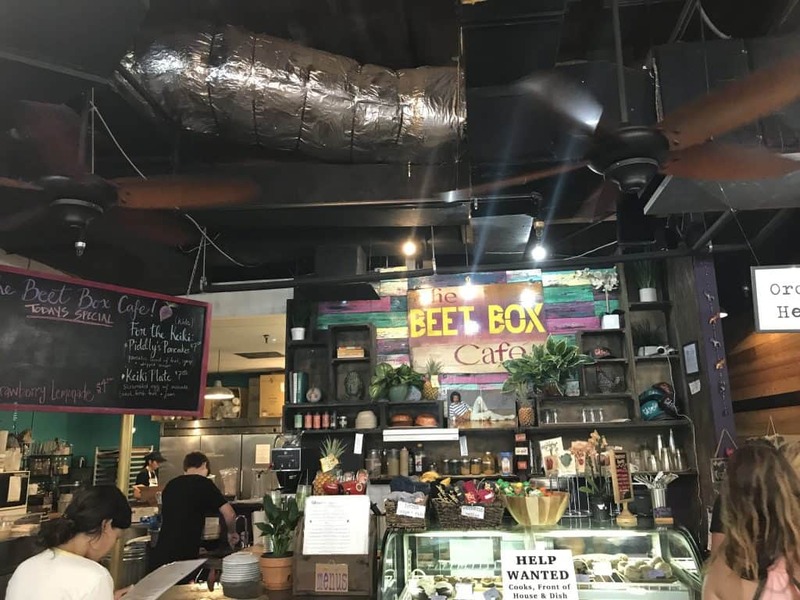 Of course, you can go crazy with the crazy marinated tofu, pecan nuts, heavy vegetable salads, everchanging offers of Mexican, Indian, Hawaiian, classic foods, but if you don’t overload your box you won’t get a heart-attack when you see the price. They also have bulk boxes of grains, nuts, seeds, dried fruits, snacks, and granola, as well as all extraordinary kinds of raw treats. The focaccia is something that I highly recommend as well. 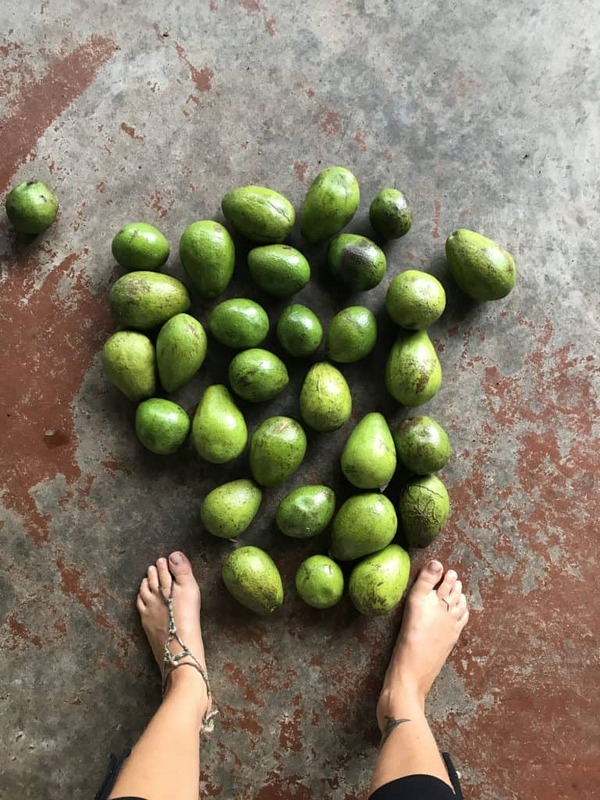 Get some avos from the tree and some sea salt and you’ll have a really nice meal with under 5$. 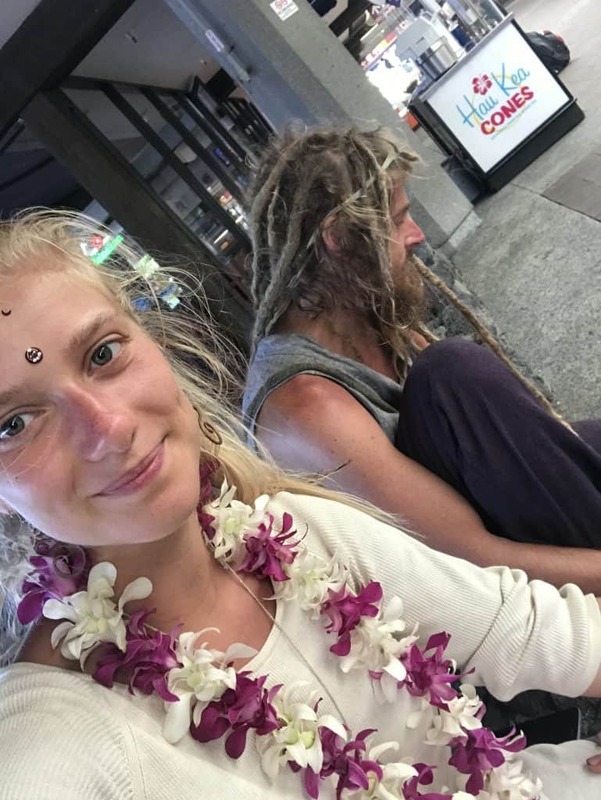 The most amazing thing is, I knew that the people there are living from basically no money, but still all their money went to either ecstatic dances or the natch- how we liked to call it there. 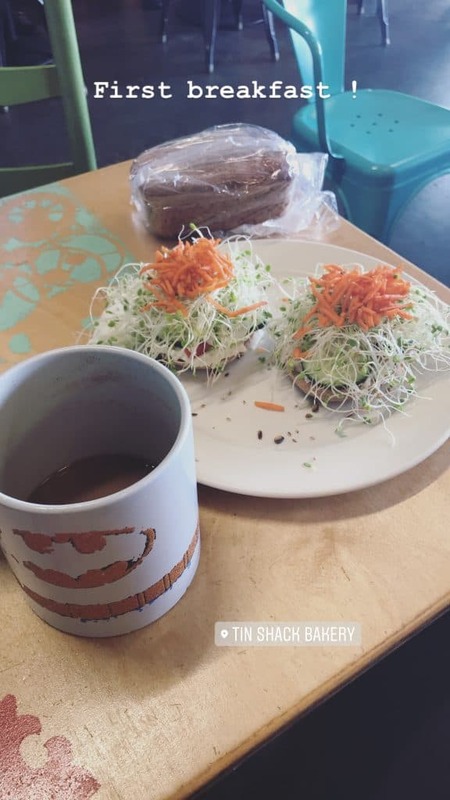 When I started to explore the rest of the island I have met a super nice lady who runs the cafe “ono”, who served vegan cafe lattes and amazing local art, told me that the ONE place I had to go as a vegan was Herbivores in Kona. 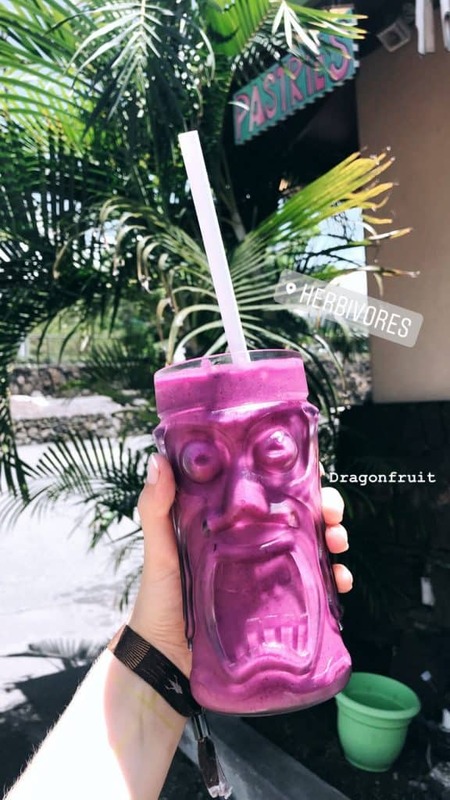 As a “starter” I had a super refreshing half-frozen Dragonfruit smoothie, which I shared with you as well. It was a super hot and humid day, so I was grateful for this cold drink. In love with this tiki-glass. 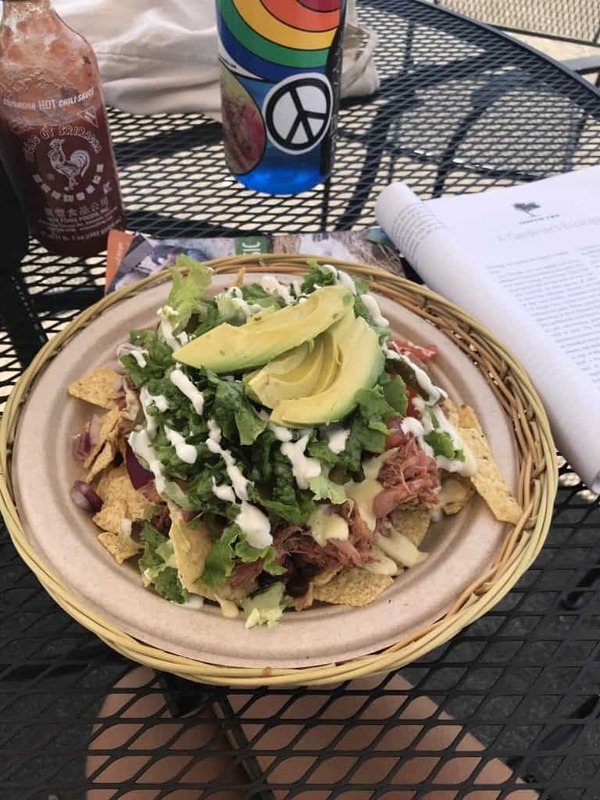 As the main dish we had the Jackfruit Nachos with salad, pulled jackfruit, cashew cheese, and avocado– It really blew me away. The seasoning for the Jackfruit was a dream and although it was a rich dish, I felt light and fully satisfied afterward. Always again. Unfortunately I was too late for the breakfast menu, otherwise, I might have eaten the whole menu. 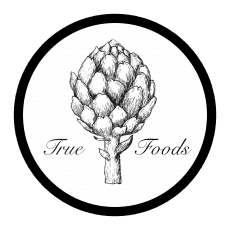 If you travel the island and walk into an organic food store, this brand might sound familiar. 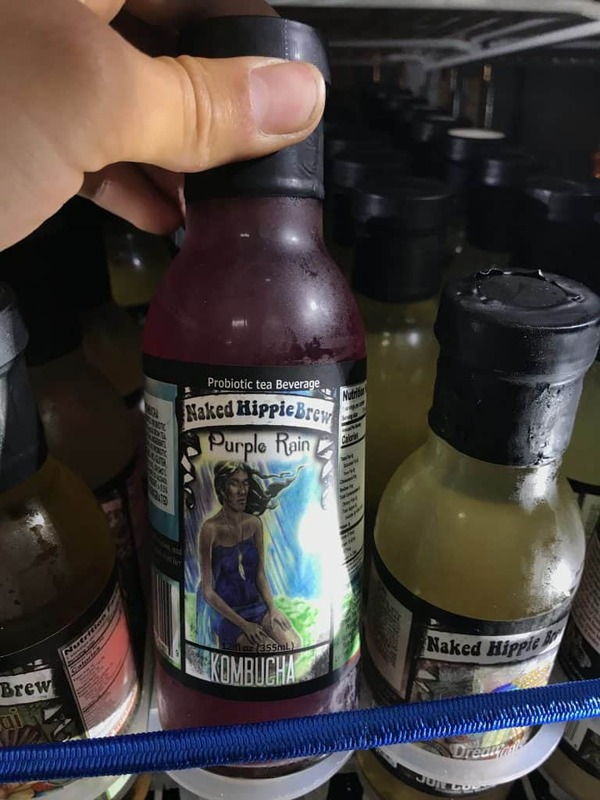 They produce all different kinds of sourkrauts as well as supporting the local food start-ups like Big Island Kombucha and Nicocos. Their restaurant is based in Hilo, downtown. THEY ARE NOT FULLY VEGAN – so always ask for the vegan option, they have them in all variations. 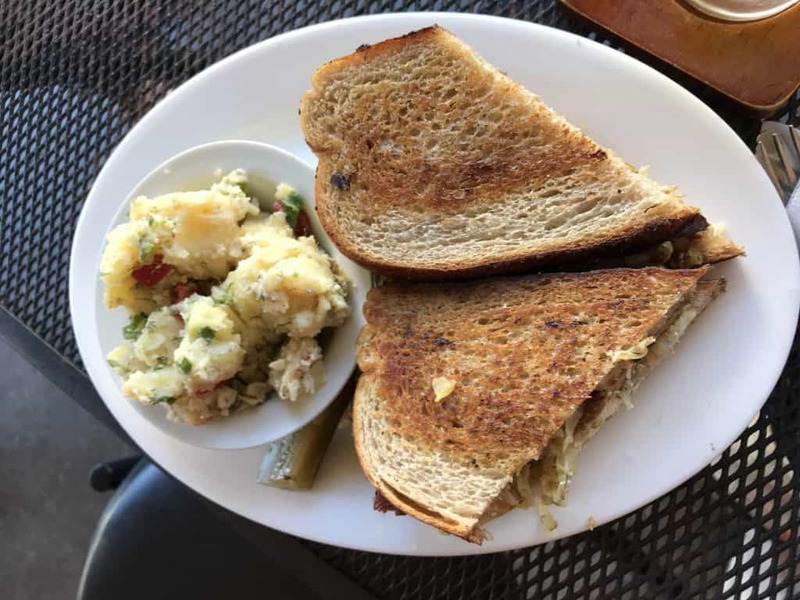 As dishes we had the Tempeh Reuben, which consists out of: grilled marinated tempeh, grateful garlic sourkraut, cultured cashew cheese, lilikoi kombucha mustard served on slow-fermented sourdough bread. It was really good ! – still, with 13$ expensive and definitely a treat. 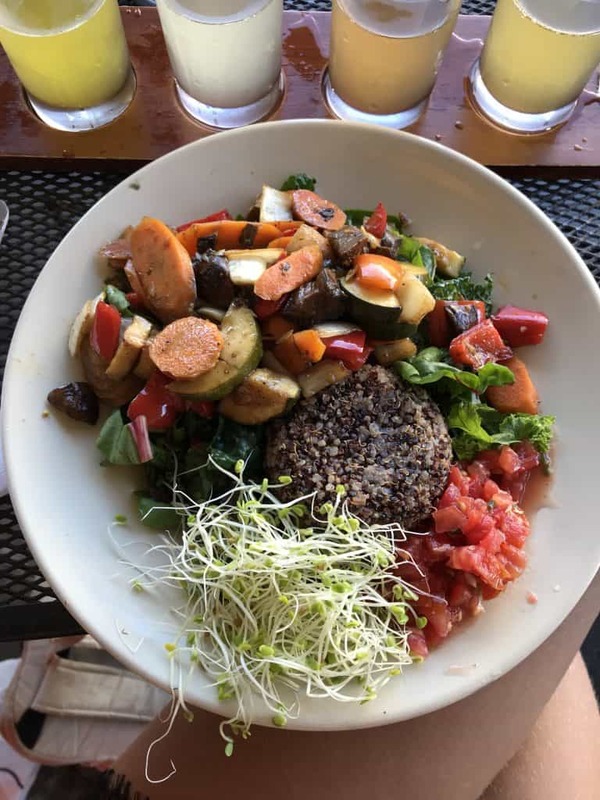 Next, I had the Roasted Veggie bowl with Roasted mushrooms, zucchini, sweet onions, bell peppers, carrots, served over organic beans, brown rice or quinoa, layered with vegan pesto cream sauce topped with fresh tomato salsa and sprouts. 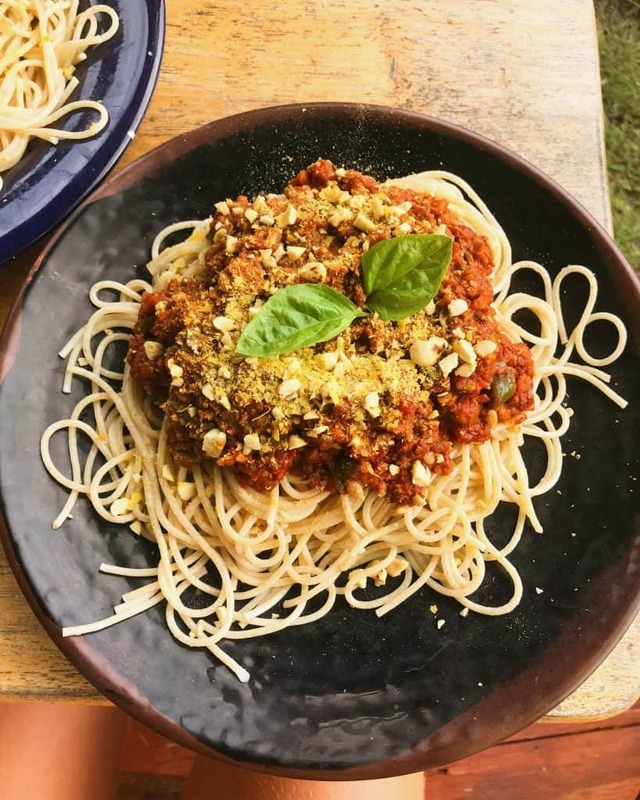 “Hey, I really feel like in my short fitness-phase where I would only eat veggies and quinoa” – it was delicious but nothing special (this defintaly was my fault, because I ordered the simplest dish). yap, you read correctly. I want to be authentic and honest with you. So I admit that I ate out at Dominos Pizza sometimes. 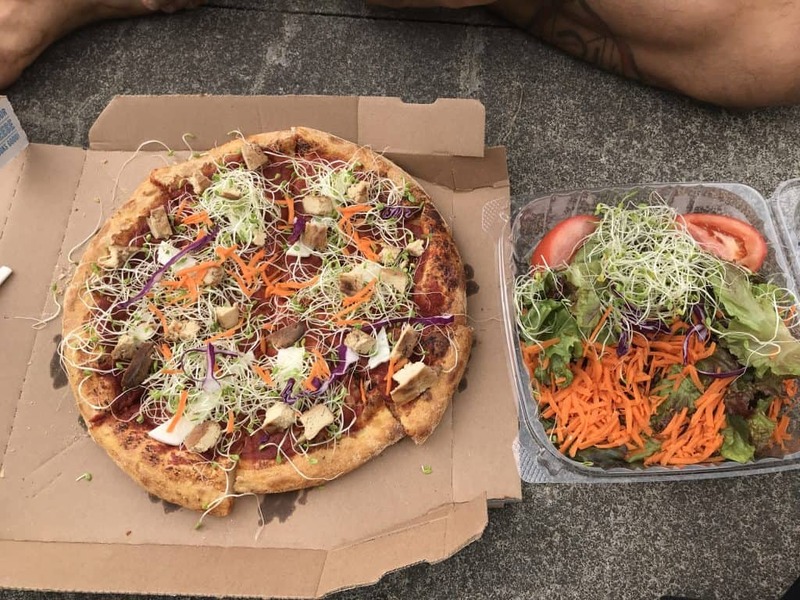 I ordered Pizza just with the tomato sauce and added a ready-to-eat salad from the Natural Food Store to get a satisfying meal. 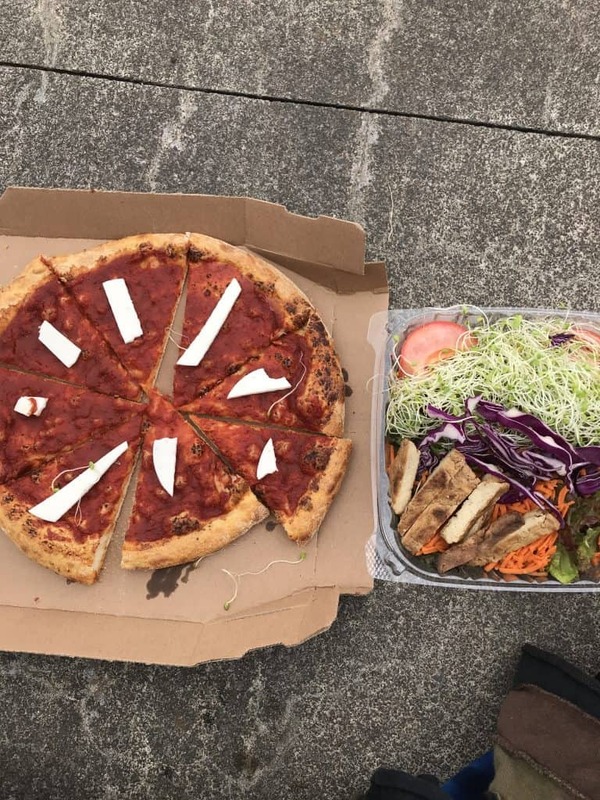 I did that in Waimea Big Island, where Natch and Dominos are directly next to each other. Dominos is not the most sustainable and definitely not the healthiest thing, but really convenient. Put on top and you’re done! Finally, here it comes! 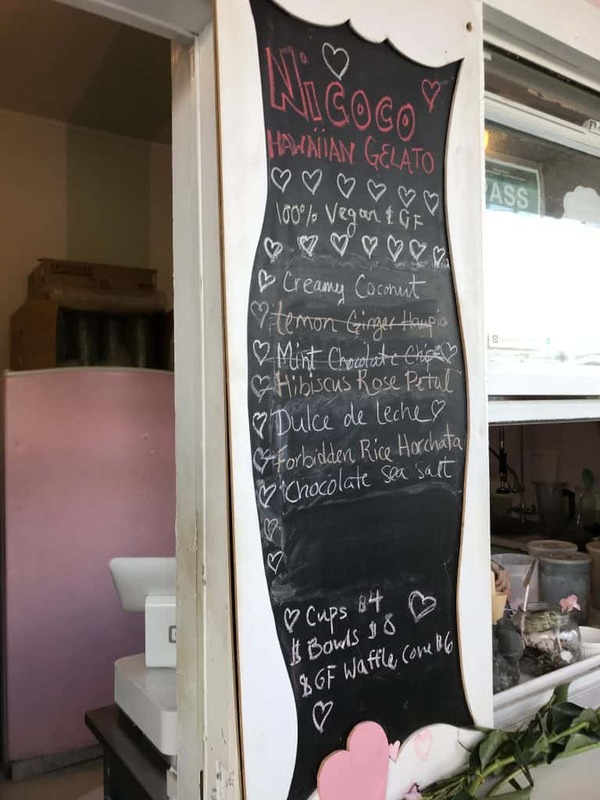 Nicocos ice-creme, vegan gelato. I fell in love with Nicocos, right from the beginning. 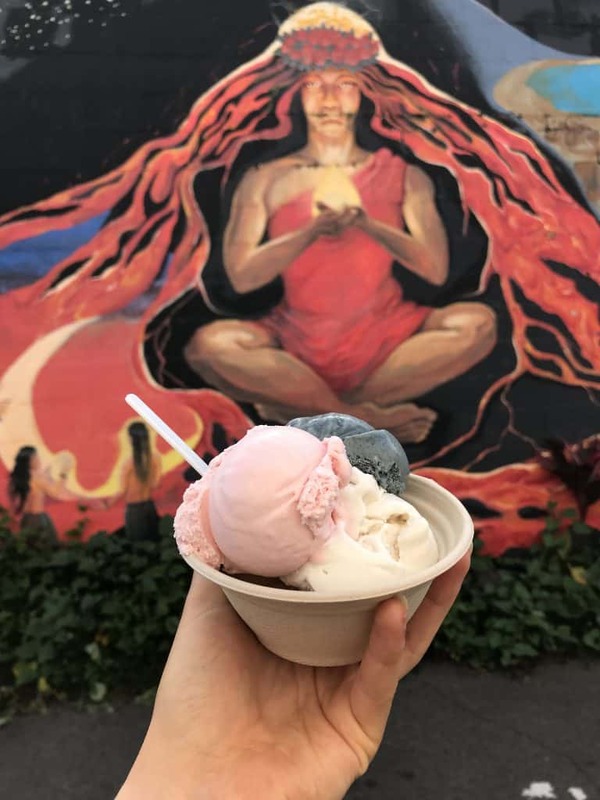 I first had a taste of Uncle Roberts Night market and later on in the city of Pahoa. I literally tasted everything they have on their menu, which is always changing. 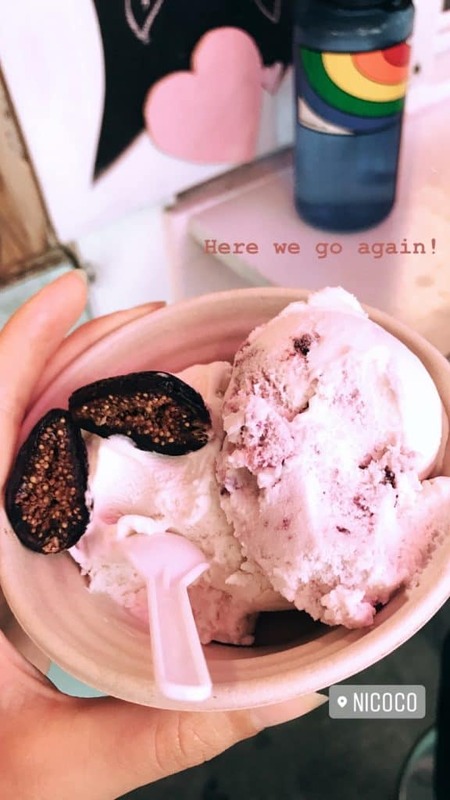 Their gelato is based on coconuts which give it a super rich and creamy texture but not overwhelming you with a coconut flavor. By the way, you sometimes have to be fast, they are not only my favorite but also the favorite of everyone closeby, so oftentimes they sell out at the end of the day. Seen in the picture below. I am not a big waffle fan, BUT! They make a gluten-free, vegan, fresh waffle. Seriously, they bake the waffle right on the spot, so for 2 $, you get a freshly baked, warm waffle which was the best waffle I have tasted even in my time where I wasn’t vegan. I hope I will have the chance to taste their gelato one day again. 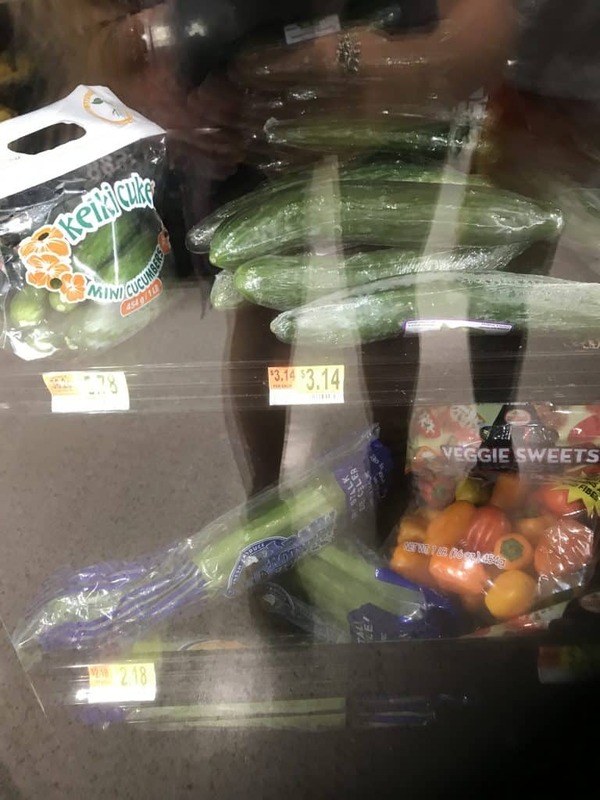 The cheapest way to get your fruits and veggies! Also, social events which you should not miss. Here you see different weekly purchases for two people. This was incorporated into the food that I also bought in the Natural Food Stores. A typical Shopping list is to be found in the section below. 3. layer: the second layer with raw cacao and 2 dates. This was the chilled carrot (here I used whole ones instead of juice) with young-coconut, avocados, and miso. 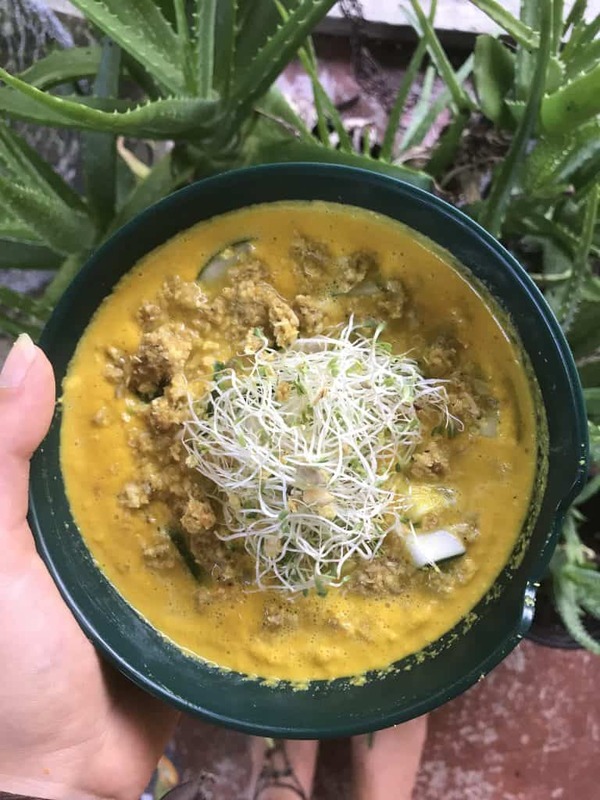 Ingredients: 1 Cup of Oats, 1 tbsp Curry powder, 1 pinch of salt and 2 tbsp of honey & coconut oil. Blend and you’re done. 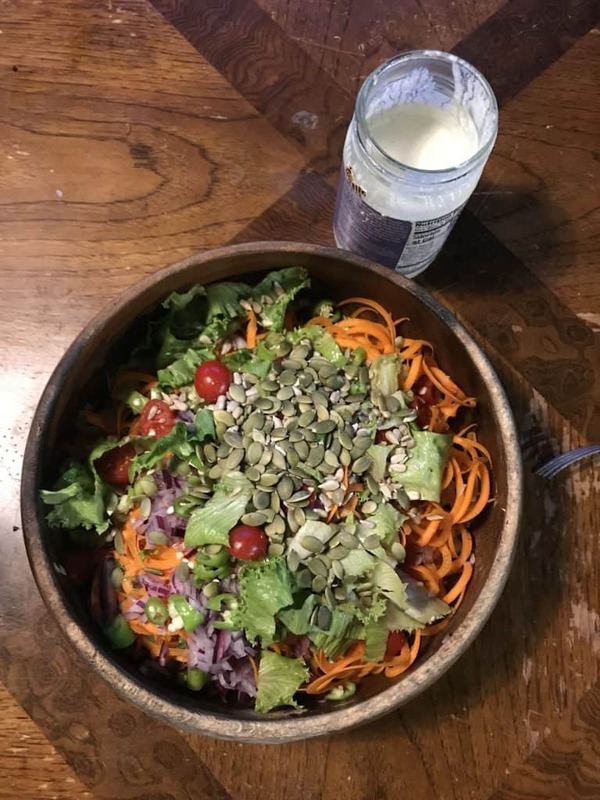 This was a raw vegetable noodle bowl with a vegan macadamia nut dressing which was to die for. 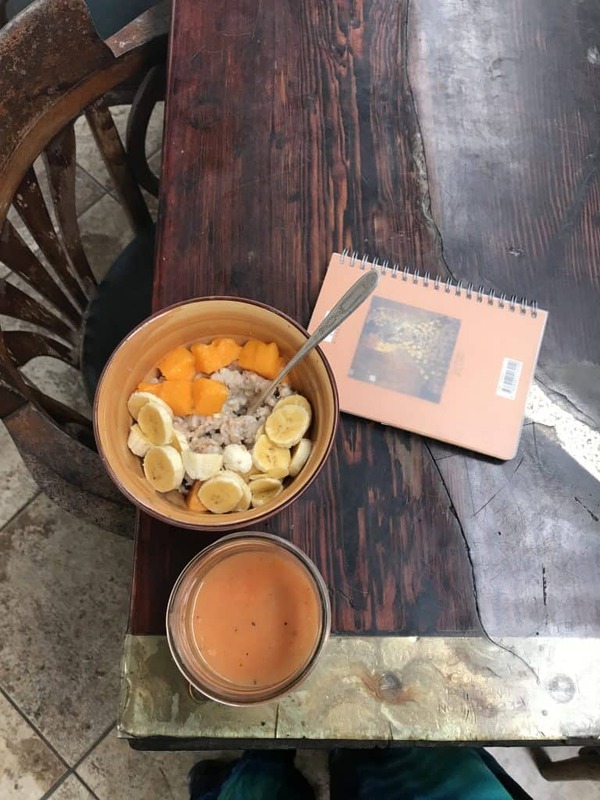 Classics: Fruit bowls with a smoothie. My personal favorite was the combo of Apple-Bananas with Lilikoi. 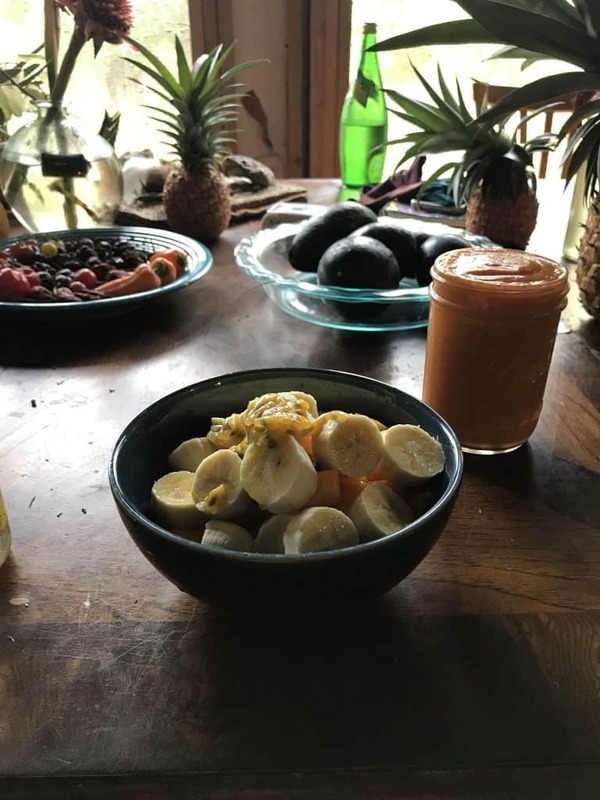 Typical Smoothie ingredients: 1 young coconut, Papayas, Apple Bananas, Lilikoi, Ginger, Turmeric and everything else that I could find. 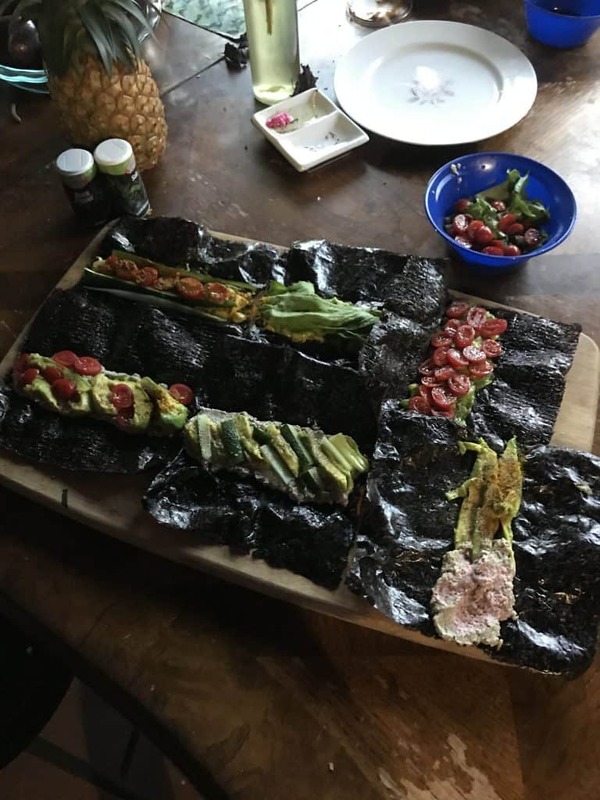 Nori Wraps: with Avocados, nut cheeses, date tomatoes, cucumber, lettuce, and curry. Dip: Peanut Butter and Tamari Sauce. 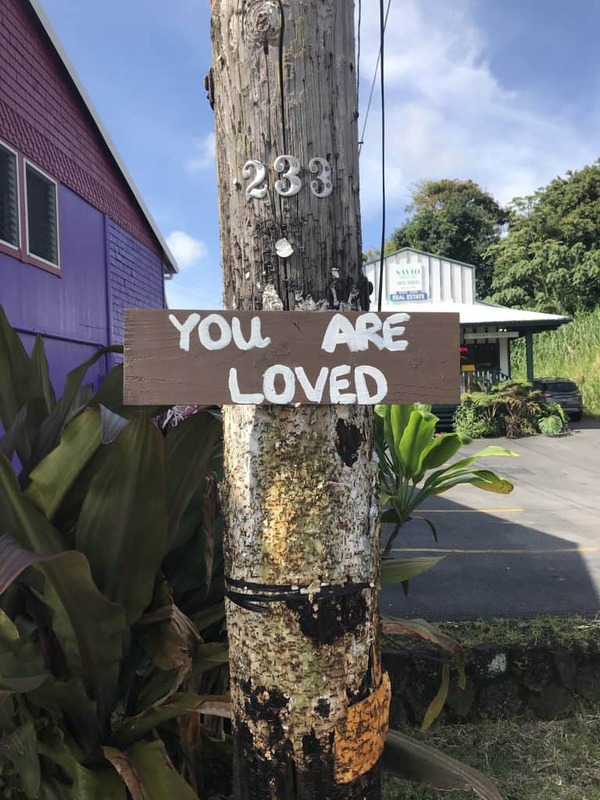 Mahalo, the polynesian word for thank you, to everyone who has made the time to read this article. Special thank you to my Ohana – my family. That is what the people that I have met became. 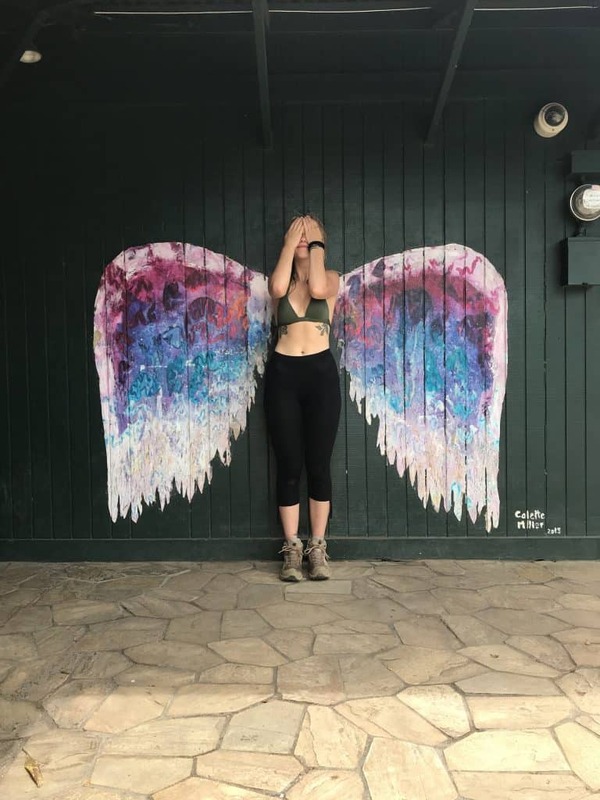 Unfortunately, I did not take photos with every one of you, but it was you who made this journey so special ..
Or you have been my home, my shelter and I have spent weeks with you…. Thank you, Eric. You are my soulmate and I love you for everything you are and what you do. Thank you for giving me shelter, being home, being my first permaculture teacher, make me laugh, cry and inspiring me. People of Puna I love you ! Thank you for being a child with you again. Thank you for all the dancers – all the free spirits, for the old Polynesian men who sang for me and invited me to call him Apa, the man in the Cowboy costume with his wise words, Erin who trusted us so much that she gave us her van, Ryan who has brought me to my first ecstatic dance and showed me what it means to be mosy, Cody Bear for sharing coconuts and sacred moments at secrets beach, Clay who showed me how to fire dance, clay2 who gardens the islands, Nika who brought us to Puna, Cat for being you, Steffi for sharing your story, Simon for giving us your van without a wink, Nickel for the tattoo, the Krishna family for giving me this experience, coconut Chris for opening permaculture for me, Mathias for inviting us to sleep in the dschungle, Emma for sharing her butterfly story with me, Avri for being crazy as you are & telling me about Tamera, Chris for being my partner in crime and my one and only twin flame, thank you Mama & Willy for always being on track . 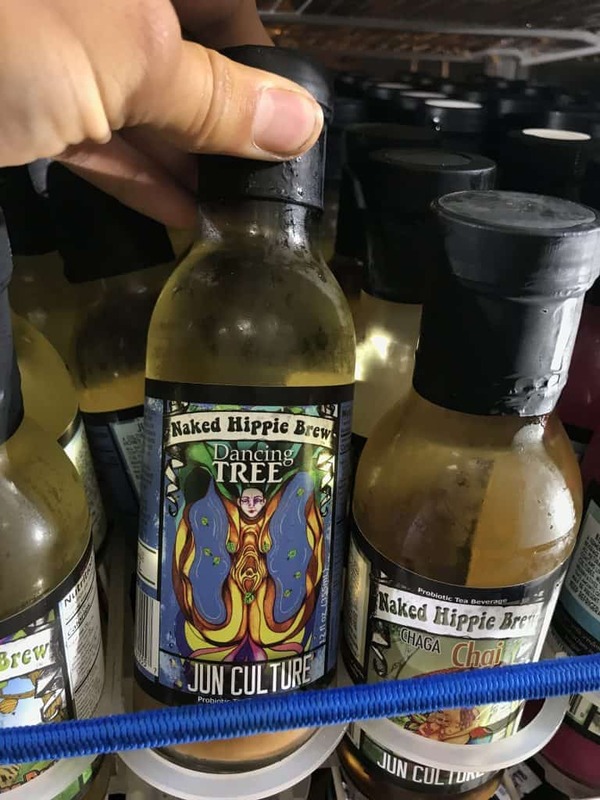 Great guide, but I want to add one of my faves on the Big Island – Under the Bodhi Tree in Kona https://www.underthebodhi.net. It was close to our hotel and we ate there several times. Delicious food and great atmosphere and staff! Thank you Sally, sure ! I trust your recommendation 🙂 Maybe one day I will have the opportunity to check it out – I already dream of going back 🙂 Mahalo my dear !